With the possibility of new development going into the acreage located behind my house, my first line of thought (after groaning and whining about it) was to subject myself to the fact that it’s probably time to look into fencing options since my family’s privacy is a priority to me. 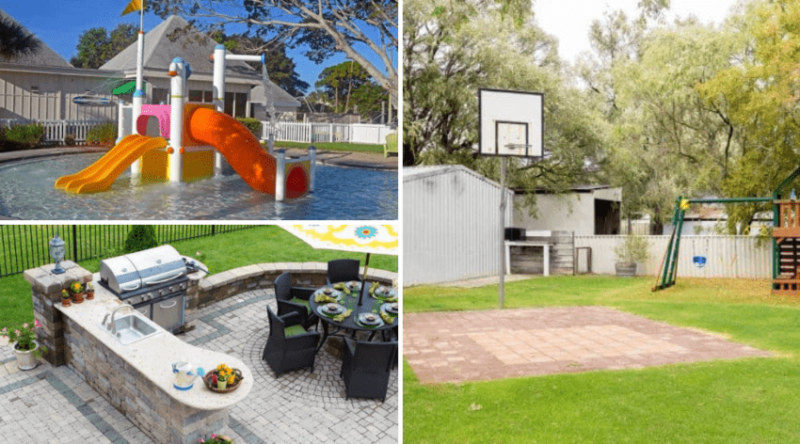 Fencing may very well be a necessity to keep curious eyes in check concerning your backyard going ons, but your choices don’t have to be traditional in nature if there is no getting past the need for one. 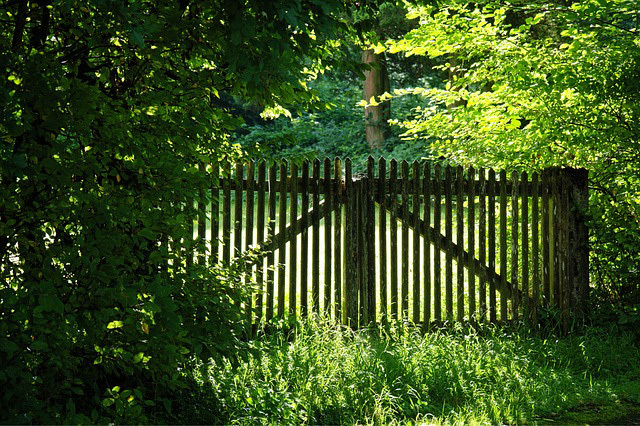 Yard and garden fencing can be so much more than a solution surrounding a privacy issue however. Fences provide backdrops to garden beds, support planters, highlight ornamental pieces, and help keep certain plants under control as well. They can also serve as a stand alone piece to bring further aesthetics to your outdoor living spaces as well. 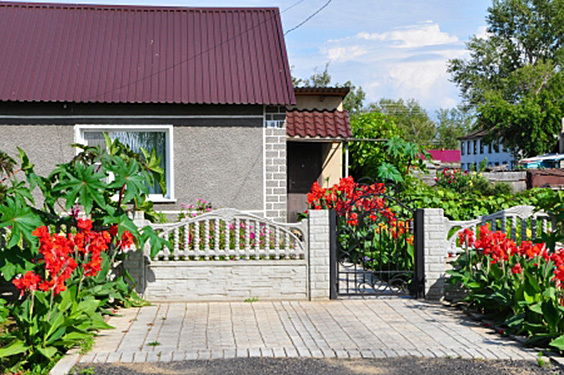 The materials, shapes, and colors used can all be incorporated into your landscaping to turn what you may have initially thought of as a nuisance to create into an integral part of your landscaping design. 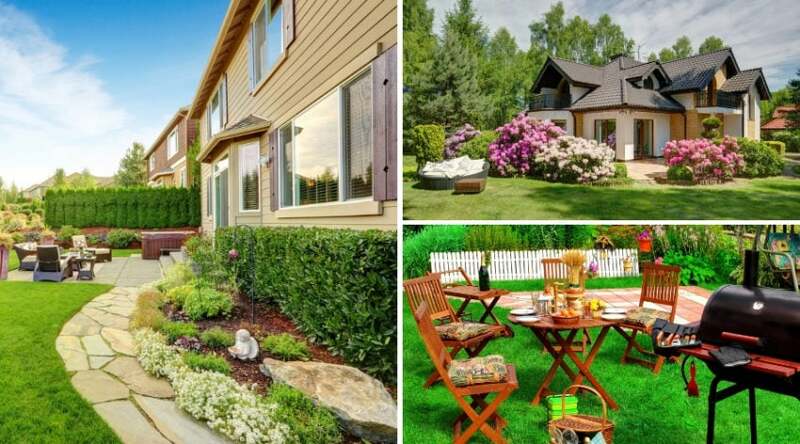 In my attempts to calm myself over losing my backyard view, I decided to research the many options open to me to make sure I have something I can both afford, and like as part of my colorful and unique property scape. 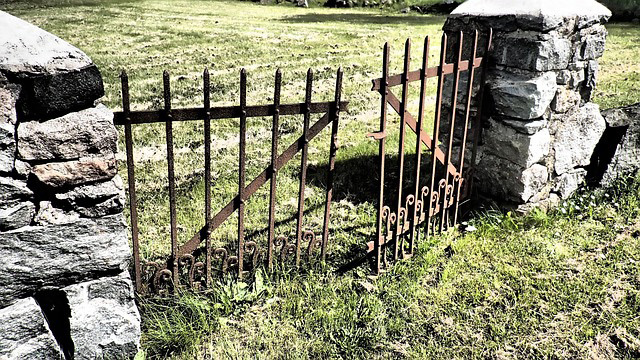 Read on to explore the 118 fencing designs and creative ideas I managed to dig up. I’ll admit I lean towards the more rustic wooden look when initially planning any sort of structure on my property, despite knowing there are a ton of other material option available. Wood has a comforting and natural look that almost looks as if it’s continuation of your landscaping design. 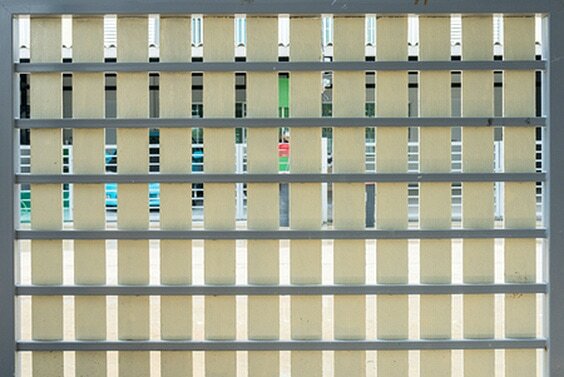 Traditional 3-slat designs can be found throughout the world for basic fencing necessity concerning boundary markers, and large animal control. Rustic split wood weathers over time to give your fence a unique look against the bright flowers you might consider planting along it. Boundary lines take a country cottage twist with these carved posts to mark the division along a pathway. Consider lining your driveway and twining annual vines along the post throughout the spring and summer to welcome your guests for a visit. 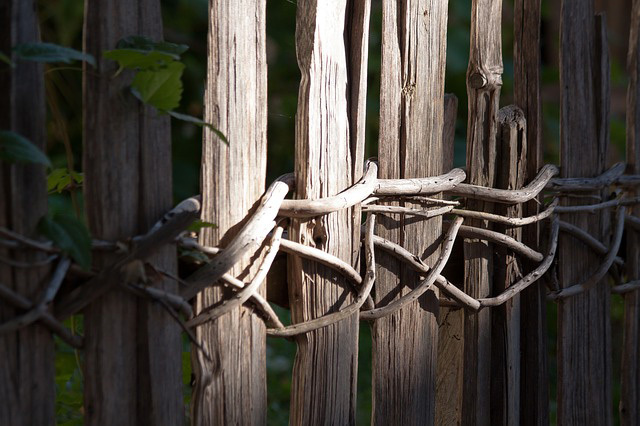 Weathered split rails are bound together with live vines to create a living fencing option. Although this may take a few seasons to complete, quick growing perennial vines, such as grapes, trumpet vines and wisteria can be trained to take on the shape of anything you desire. 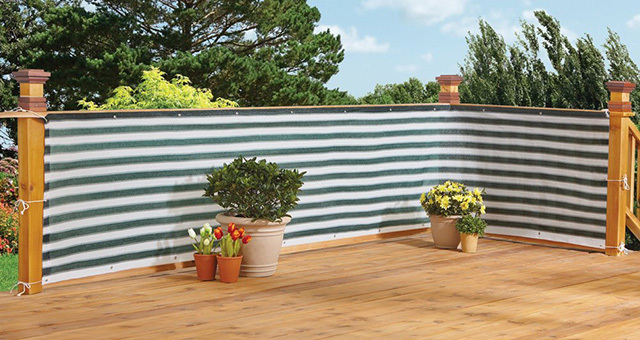 Traditional shaped slats form a well manicured backdrop, as well as decent privacy since you can choose the heights of your slats to fit your needs. The natural wood can also be painted to add the individual touch you crave, or even have planters added to it to expand your garden up! 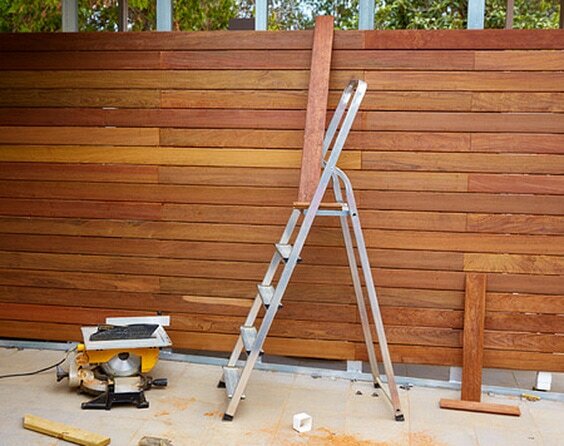 Cut timber provide the perfect support for climbing plants, as well as a primitive structure for planters, and other types of ornaments and lighting you may want to place amongst your landscape. All natural wood will weather, even with the best of treatment, but that’s what makes it such a pleasing part of your outdoor design. 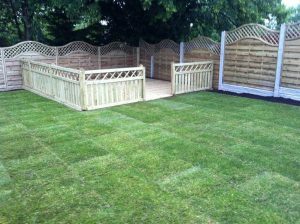 Even well cut and designed fencing and decking adds interesting contrast to the most contemporary of spaces. Using only rounded structural posts as your fence is brilliant due to the fresh new take on curvature and shape to will add to your garden, but painting your post adds a touch of the fabulous! Closely placed fencing materials creates clean lines and excellent privacy from both sight and sound when the occasion call for it. 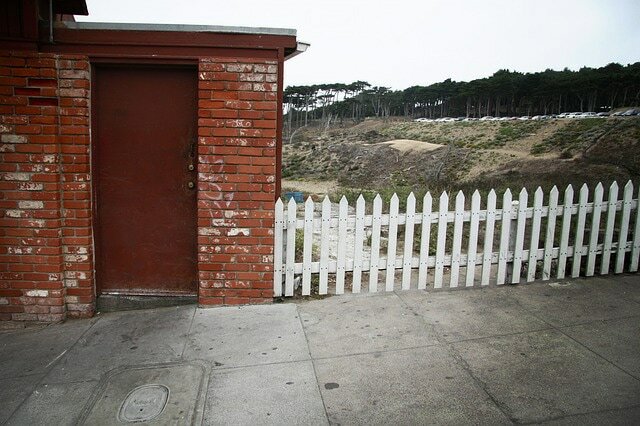 Despite being more contemporary and acceptable in most neighborhoods, it still provides a provincial view. 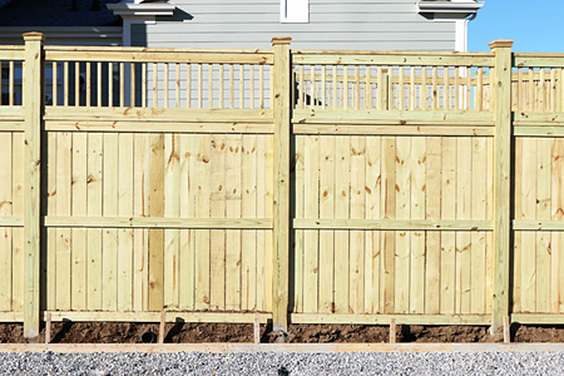 Using slatted fencing design doesn’t mean it has to be placed flush against another piece. Create long shadows each afternoon by giving your fence materials room to breathe while still maintaining the needs to have it for. Just because you have chosen a wooden structure doesn’t mean it needs to stay in its natural shades of brown. Consider muted bold tones that help highlight the colors of the vegetation you have planted within it’s vicinity. Cedar is just another name for wooden right?! Well, not exactly. 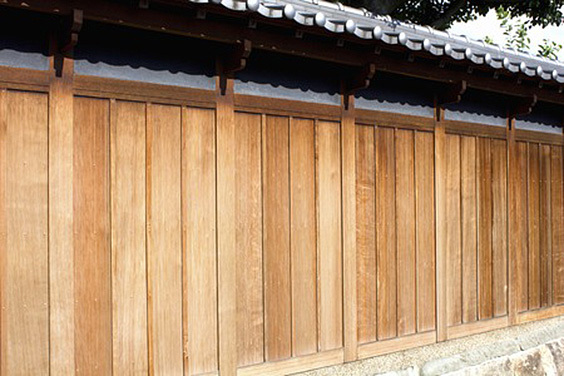 Most popular wooden fences derive from pine due to availability. 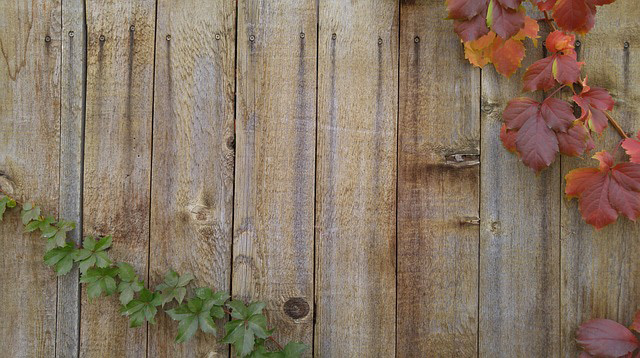 But if you are considering a wooden fence that will last your lifetime, consider using cedar. Cedar is naturally resistant to rot, decay, and insect attacks. 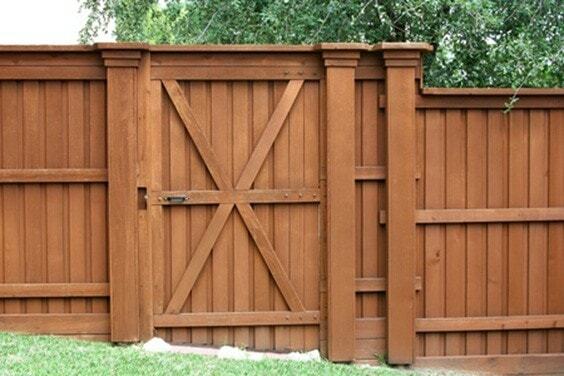 It also comes in rich red and reddish brown hues that add unique interest to your fencing design. Wide planks create natural looking separation and provide a simple backdrop to blooming flowers. The natural ability of cedar to repel insects can definitely come in handy when used amongst your garden. 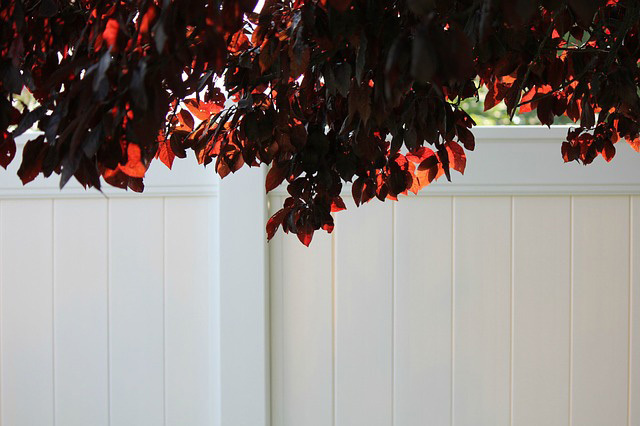 Red hues boards will keep their natural color throughout the seasons with little to no maintenance required. 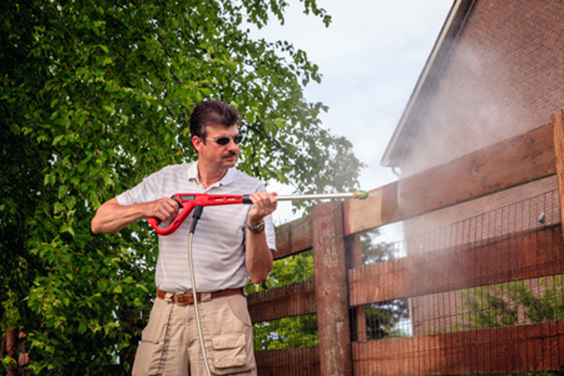 To brighten your color, wash off the accumulated dust and dirt that can build up due to element exposure. 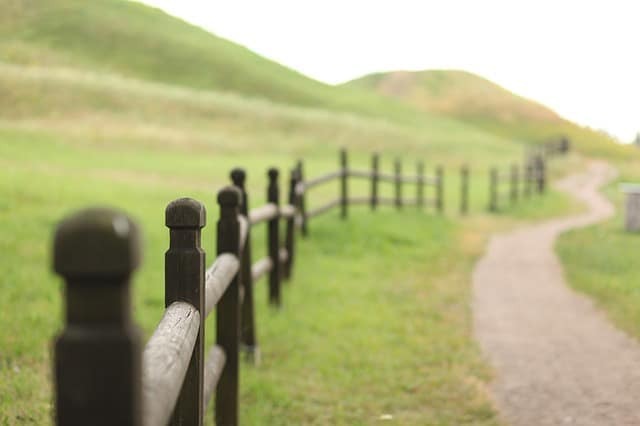 As with any wooden fence option, split rails and shaped posts lend a primitive feel to your yard boundaries. Toss a wildflower mix to the unmanicured side to give the look a country cottage feel. 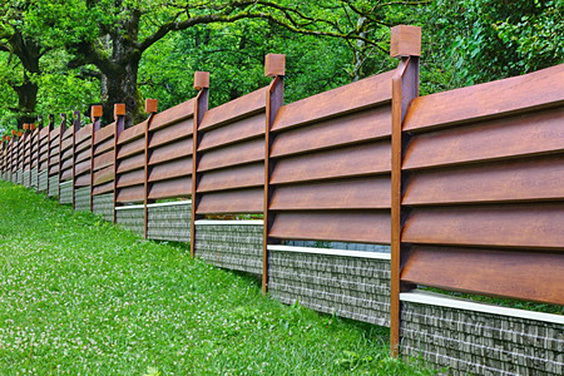 Wooden fences can provide sleek, modern looks with the use of more rustic materials. Treated cedar boards keep their shape well throughout the years and warp very little in the elements to keep the contemporary look you crave up to date. 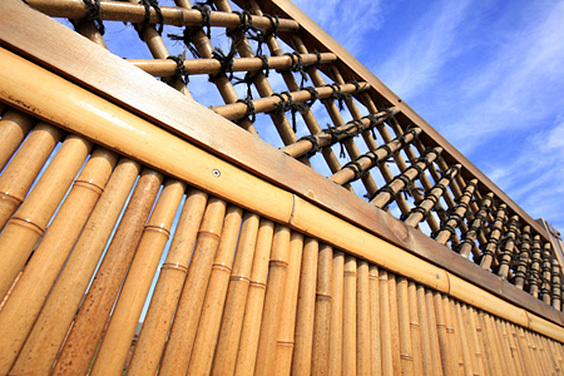 Bamboo is an inexpensive, readily available, and lightweight choice for privacy screens and border ideas. Resistant to rot, bamboo is a popular choice when durability and longevity is needed, but not necessarily strength for mounting purposes. 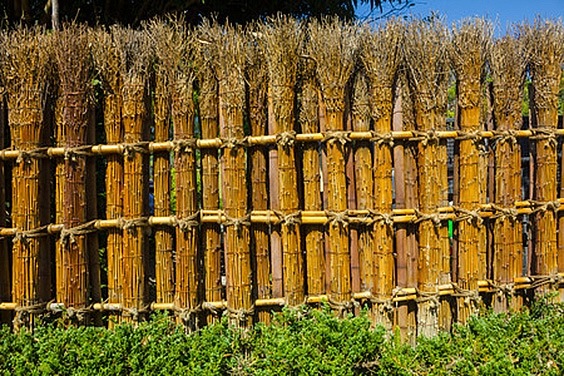 Layering bamboo posts doesn’t only strengthen your fence, it also provides texture and interest to your yard. 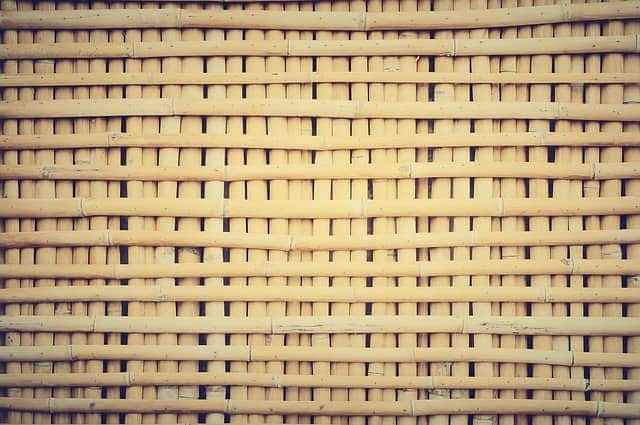 Bamboo inconsistencies are part of the aesthetic draw that makes them a popular item to have in the garden. Evenly cut bamboo provides clean lines and lengthening heights and provides a continuous look to your yard space even while dividing one area from the next. Bamboo is easy to trim to height to hide anything unsightly you may want to cover and allow your eyes to be drawn to those you do. 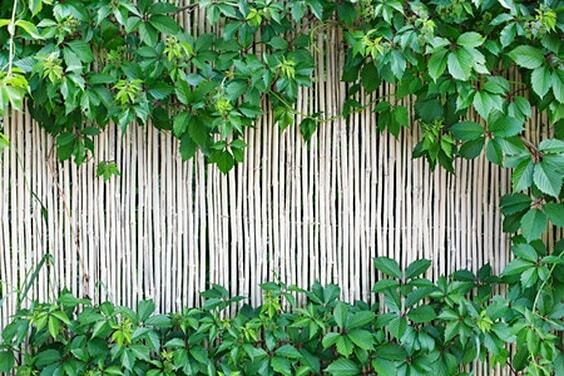 Bamboo can be purchased on a variety of widths, and smaller diameter canes can lend fither interest through the many vertical surfaces present when placed together. When used in conjunction with stronger post supports, heavy vining vegetation can also be used with it, like the grapevines shown here. 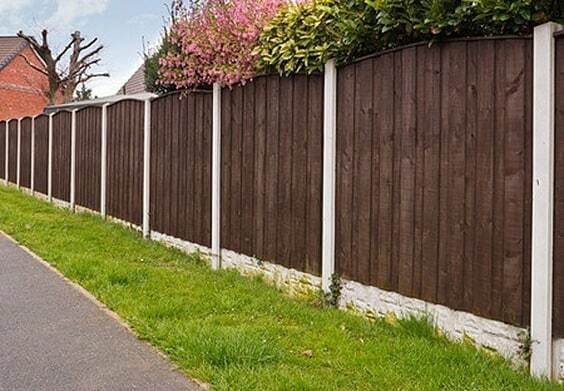 As mentioned, fencing doesn’t need to be just for privacy, or even of any certain height for boundary reasons. 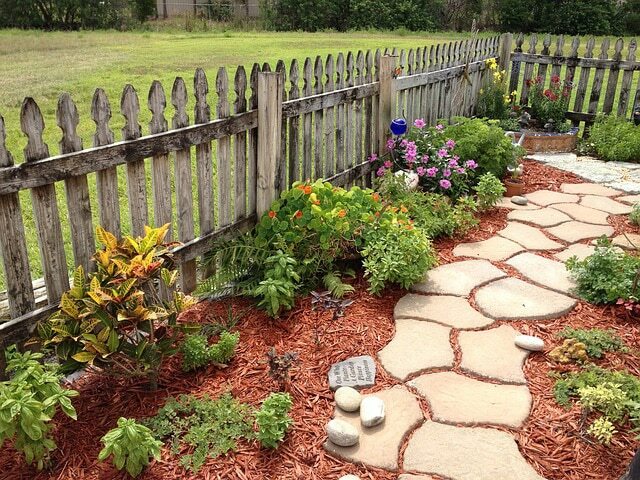 Simple half walls serve well as borders for placement along garden beds and walkways. Just because bamboo is very natural looking in nature, and is usually used due to the charming inconsistencies found in their structure, does not mean it cannot be used in a modern context. 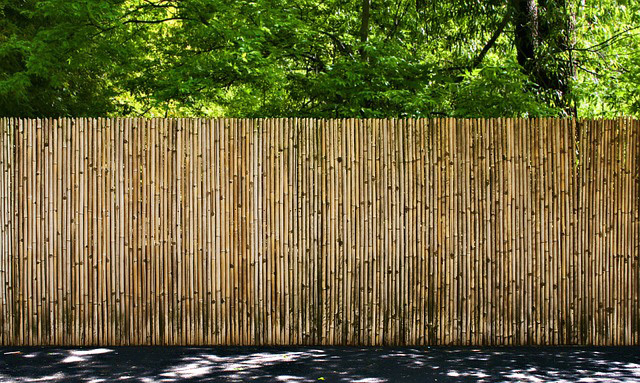 Bamboo that has been sanded down and stained make a very sleek design for a more up to date take on natural fencing. 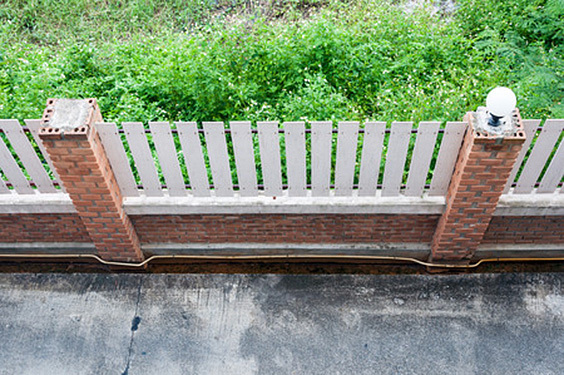 Privacy fences can be built from just about any materials, and serve one main purpose: to block both sight and a certain degree of sound from both directions. 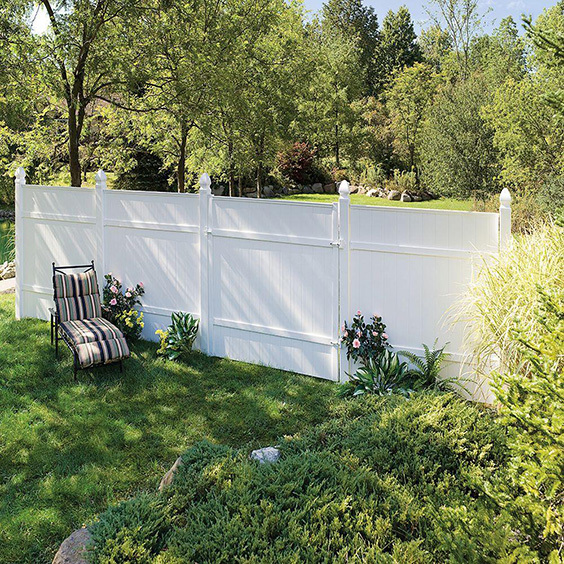 It’s also important to consider that a privacy fence often spans a shared property line, so it should be a visually pleasing boundary for both parties involved. Live hedges are a fantastic choice if you are willing to have a little patience for the filling in that needs to occur. 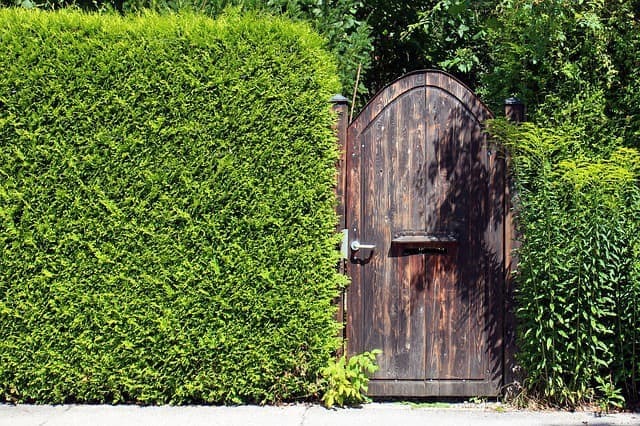 Evergreen vegetation, such as privets,thuja species, and holly are all popular choices and provide complete privacy once they have filled in gaps between plantings. Vinyl walls are possible choices for generally quick installment and can come in a wide variety of color choices. Smooth surfaces clean easily and survive well through all types of weather. 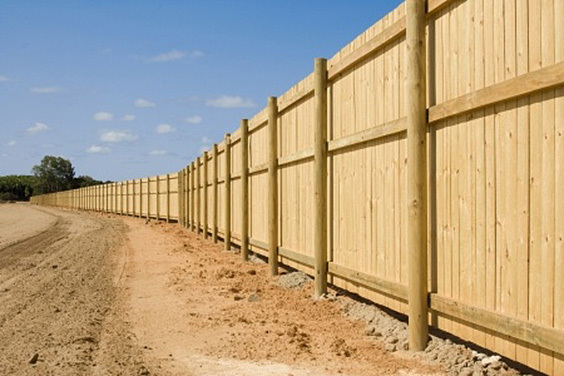 If you are considering a tall fence of considerable length, remember that fencing costs by each foot you put up in addition to post and material support. Some of the most affordable materials are the most traditional, such as cured pine boards and strong wooden posts. There is nothing wrong with mixing and matching your materials to create durability and long lasting design. Concrete kick walls and posts complement the stained wooden boards in this traditional design. Both horizontal and vertical boards complete this tall fence that provides a breakup of sight through the use of half wooden ladder effects. 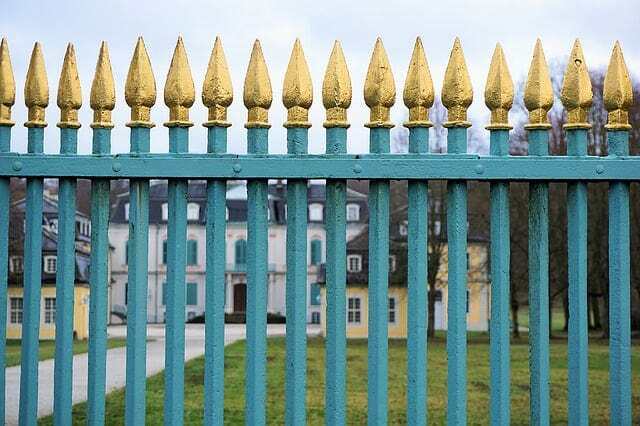 When considering your fence needs, remember that your ideas are generally easily incorporated to get the look you want. After all, you have to see it everyday! Existing fences or decking rails can get a privacy upgrade with the use of heavy canvas designed specifically to hold up to sun and wind. This patterned design ties off with the use of heavy, metal lined eyelets to keep the material from wearing in in climate weather. Just consider storing your materials for the winter which can more quickly break down the fabrics., in recent years, have been hard. Vinyl is a synthetic polymer used in a variety of building projects that can be hard pressed to tell the difference between natural products such as wood or stone. 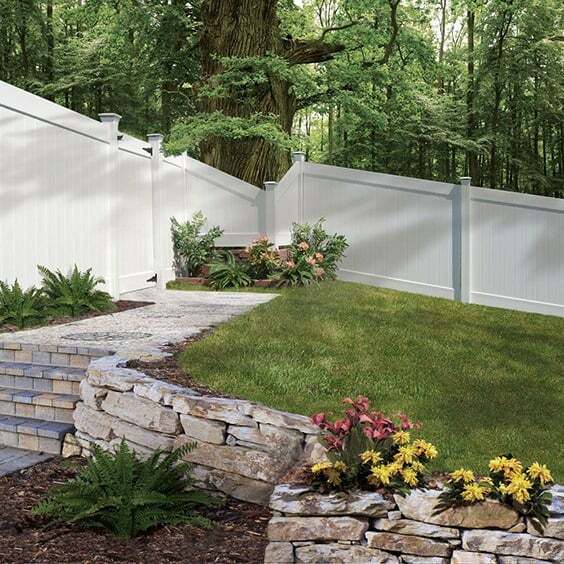 Used in fencing design you can customize both your look and design with relative ease and affordable cost. Clean lines and durability define this contemporary look that fits in well backdropping practically any landscape design. Shaped posts lend a traditional look without sacrificing surface texture to the inconsistencies found in wood. 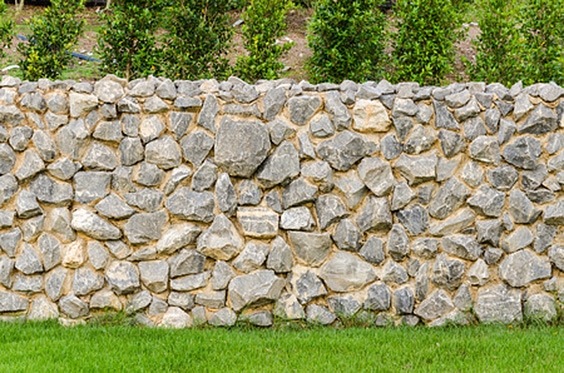 Half walls have become more popular due to their ‘floating’ appearance in a landscape that provides both secrecy and ornamental value to an outdoor living space. Tying these structures into tall hedges and boarded garden beds allow them to flow into the scape seamlessly. Hide the necessary AC behind a painted iron fence, or is it? Vinyl easily mimics the look of many other materials for fractions of the cost to provide the look you have envisioned and provide a touch of elegance to an otherwise garden bed eyesore. 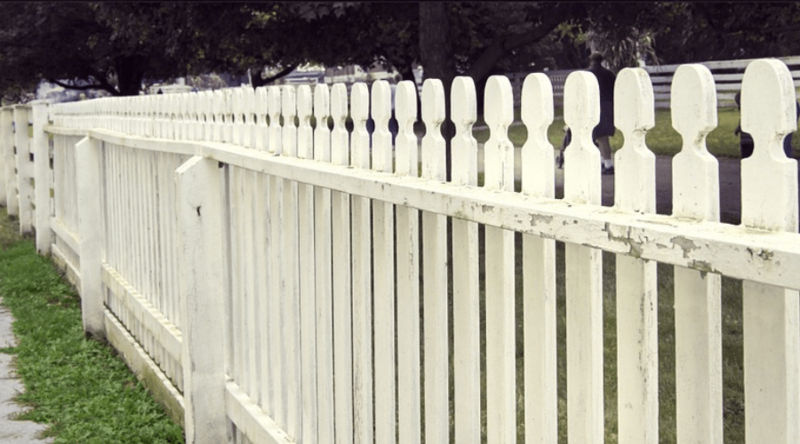 No need to whitewash the picket fence anymore! Vinyl post and boards create this traditional look with ease, and cuts back on your maintenance schedule, leaving you time to do the things you really want! 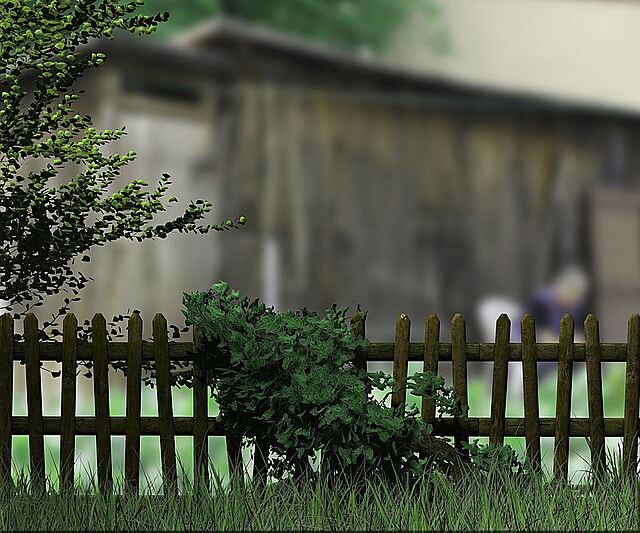 No matter how hard you try to match your wooden boards in creation of wooden fences, you will have a certain amount of abnormalities since every board cut is unique. Not so with vinyl. If you are looking for a wood look, but prefer a more modern, even texture, vinyl is most likely the answer you seek. 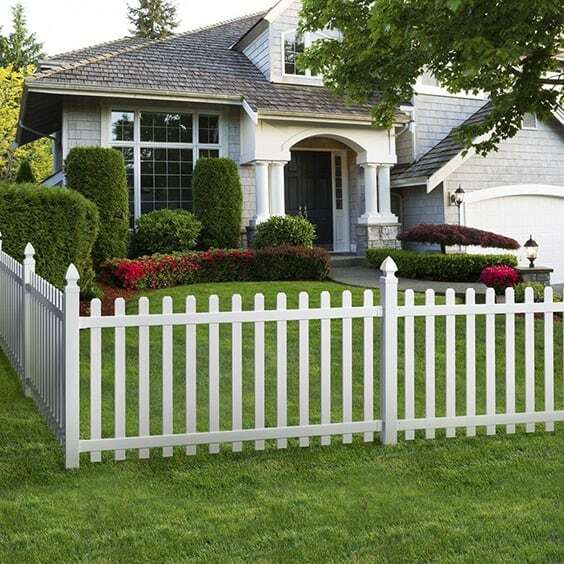 Since vinyl fences come as completed pieces, all you have to do is place together your fence either by snapping it into place, or screwing together the preformed panels. 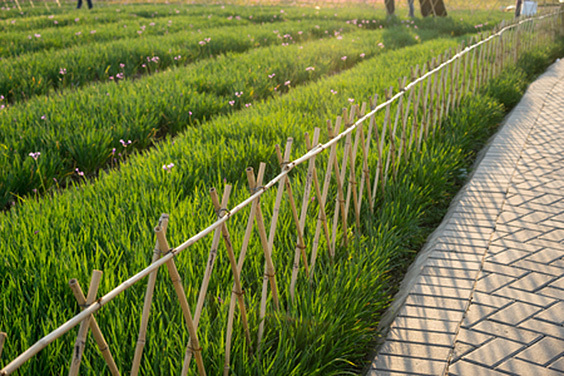 Once your posts have been secured into the ground, fencing usually slides right into preformed ‘beds’ for added security. 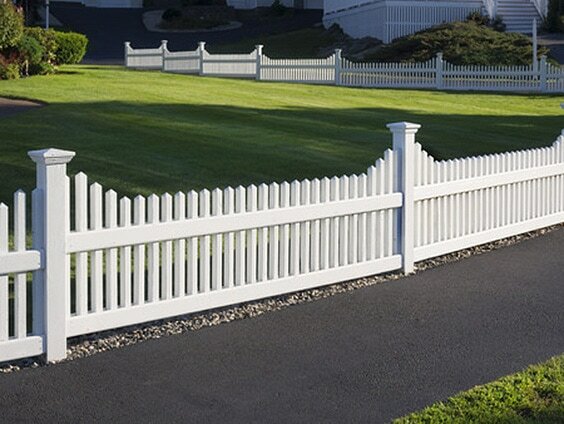 Like the traditional wooden fencing, the 3-slat design can be easily accomplished using vinyl as well. Upgrade your current look with clean white lines without sacrificing the more old-fashioned appeal. 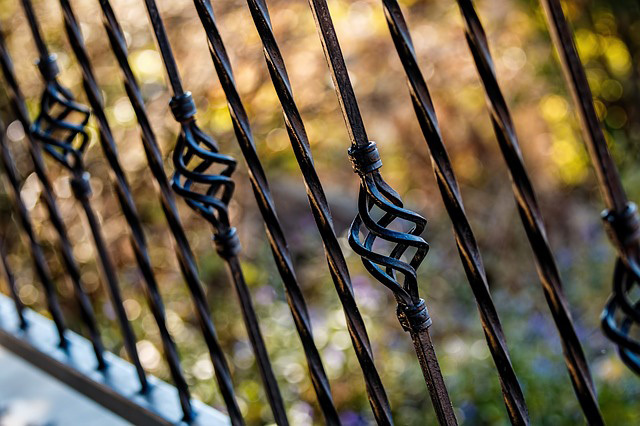 Step back in time with a popular fencing go to in the form of wrought iron design. Scrolling curves and delicate vining effects occasionally twine amongst this tied and true material that will last and lifetime, and then some. 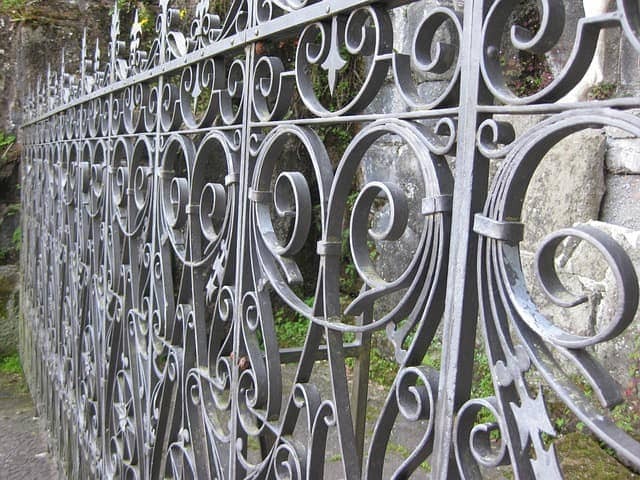 Used more for property boundaries and garden hedging, modern takes make iron a trendy and pleasing choice and have inspired further artistic license with steel and other metals as well. 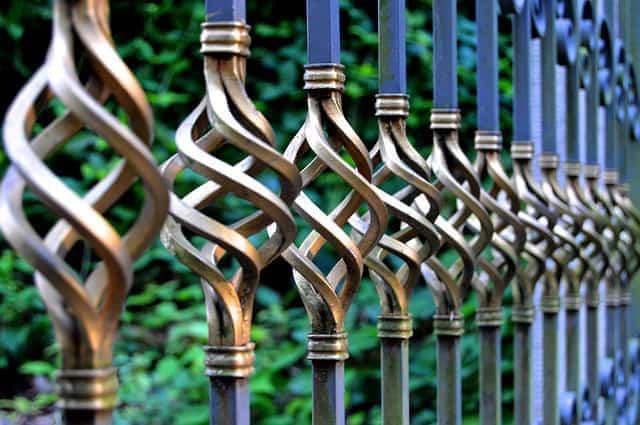 Repetitive scrolls and inhibiting fencing tops are what I think of when wrought iron is mentioned to me. Somehow it always conjures up the image of old victorian manors that have untold secrets hidden beyond their fences. Wrought iron takes paint well, as seen in this beautiful scrolling design that contrasts gold within a black supportive frame. Iron can take on the shape of almost anything you desire, but don’t ignore more traditional design you can easily bring up to date with colorful new ideas. Simple, eclectic fencing gets a ‘twist’ with well placed curves to create a well detailed fence design. 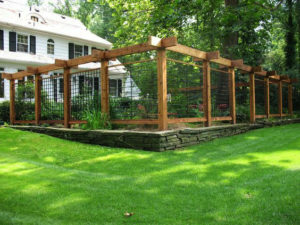 Let eyes be drawn first to well placed fencing borders that provide a foreground to bright garden beds beyond. The careful curves and designs of this fence mimic the vegetation found behind, and also provide a degree of privacy through its many different faces. If you are in love with iron design, but are in need of more privacy, consider highly decorated pieces such as this one. 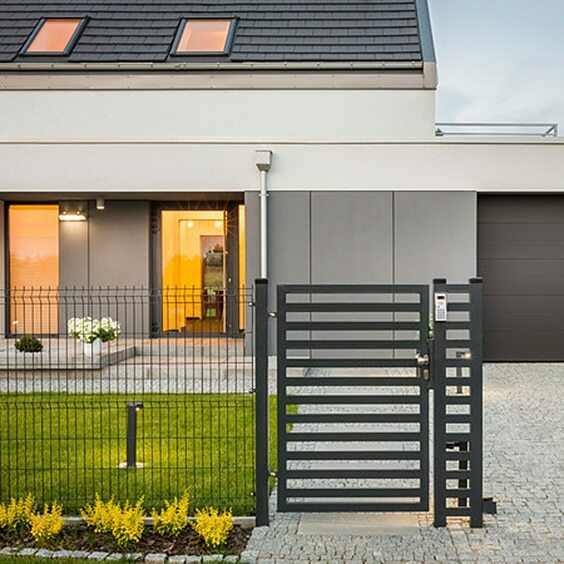 Metal takes on color well with the correct paint, as seen in this brightly hued gate. 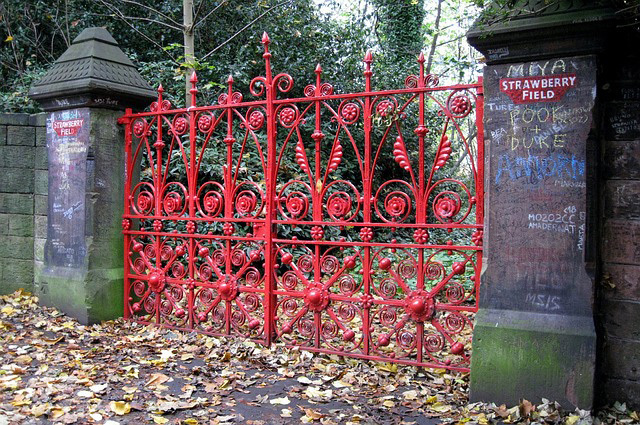 Heavy iron designs complete this piece, which, when painted red, draws the attention of passerbys and providing a degree of privacy for what lays beyond. 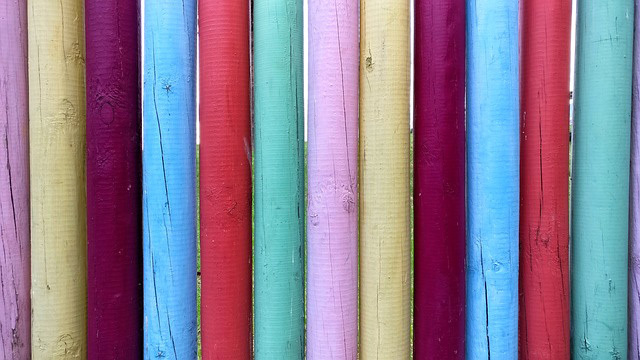 Give existing fences a rustic upgrade with bursts of color that compliment your home. The teal accent doors and yellow siding are brought to attention with this simple, artistic flair. Concrete blocks, bricks, and other materials highlight iron usage well. Contrasting materials and textures provide simple detail through natural coloration, and don’t take away from the space it is found within. Strong verticals draw the eye to this property line using both shape and color to provide a modicum of privacy, and design that keeps out unwanted visitors. Whitewashed stone foundations provide needed height for added security. 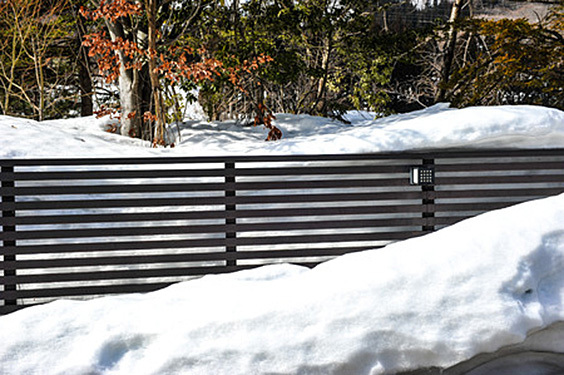 Burnished steel provides a clean modern design in this cubic take on landscape privacy. Paired with green hedges, the right angles are softened by the curves of the vegetation behind. Another classic take, iron tops a brick and mortar base for both height and style. Contrasting colors stands out both day and night from the evergreen planted behind for further privacy. Consider tall plantings with your metal work for both decor and a place to hide from prying eyes. 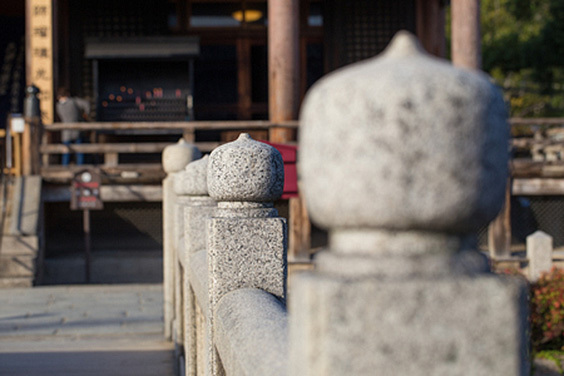 Stones used to be the go to building material in areas where timber wasn’t readily available. 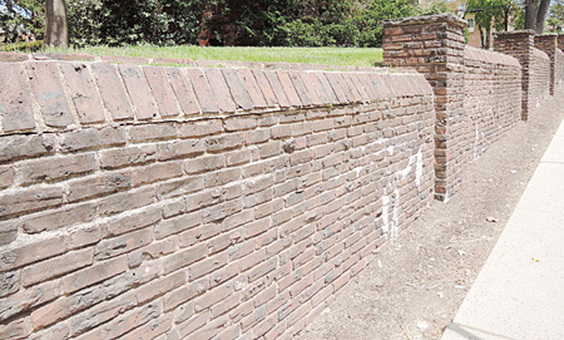 Furthermore, bricks have been made for centuries from a variety of materials to provide shelter around the world. 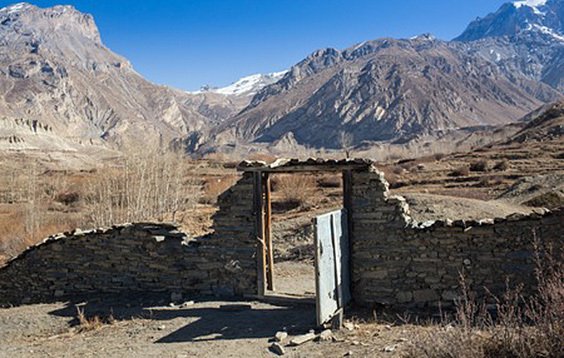 These primitive building choices may have been upgraded to for specific decor over the last few hundred years, but the purpose serves the same – to provide a separation between spaces. 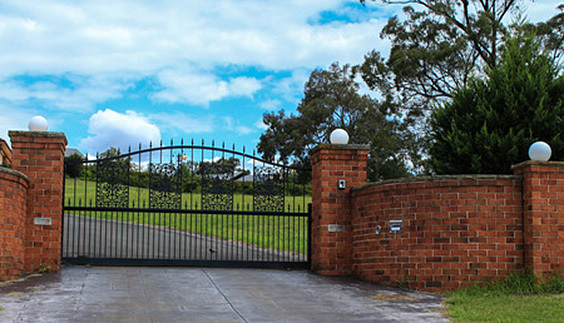 Low stone walls and weathered iron gates divide properties in this estate as a sign of ownership. 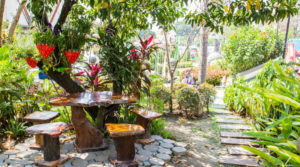 Rustic looks pair perfectly in today’s popular, rambling garden tours that show off the eclectic efforts within a garden space. I love everything brick. 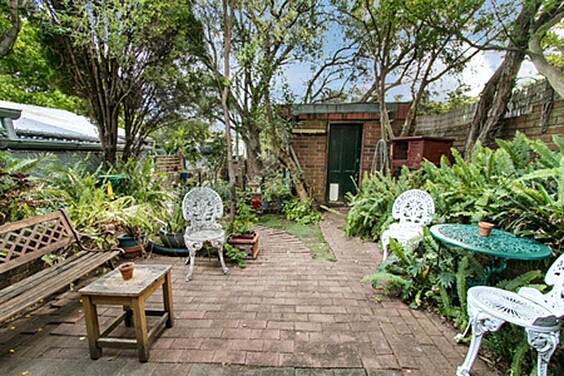 Red brick walls, walkways, borders…you name it and it’s an addition I want in my garden. 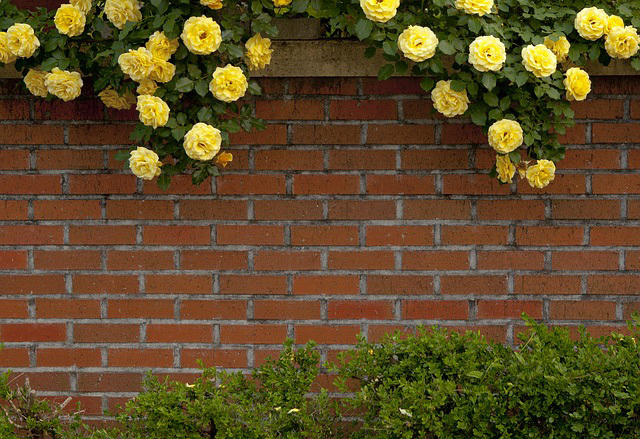 Every green looks more vibrant against brick, and flowers take on a whole new life as in this garden exterior brick wall option. 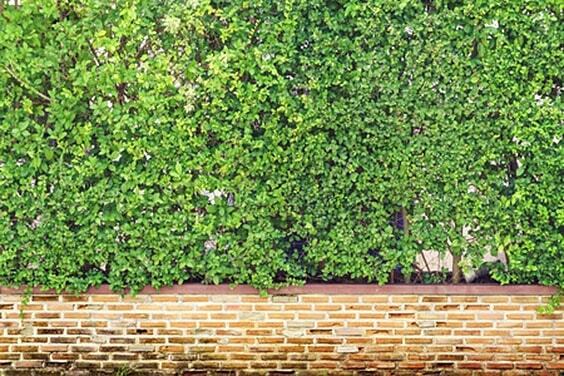 Half brick walls encompassing evergreen hedges are a traditional solution to privacy needs and provide a pretty contrast to the vegetation planted near and around it. Mix and match the occasional red brick for a textural appeal. Use your natural materials to open up your yard to vast landscapes and capture a piece of it in the vista you create with carefully placed stone foregrounds. Whether it be mountainous terrain, or a backyard pond, paint a picture of illusion with the frame you provide. Well aligned bricks still form unique shapes and spaces when stacked upon one another as this picture shows. Vertical and horizontal lines team up to create a unique look and serves well as a retaining wall for uneven landscaping. Welcome your guests (or UPS delivery guy) through a bricked gateway. The rectangular shape of bricks allows for a variety of usage to shape into curves and torrents without sacrificing their durability. And they obviously pair well with both iron and lighting options with ease. Although a white brick wall may look washed out when on it’s own, mixing in a traditional red with the use of concrete is sure to be a crowd pleaser in whatever setting you have use for it. 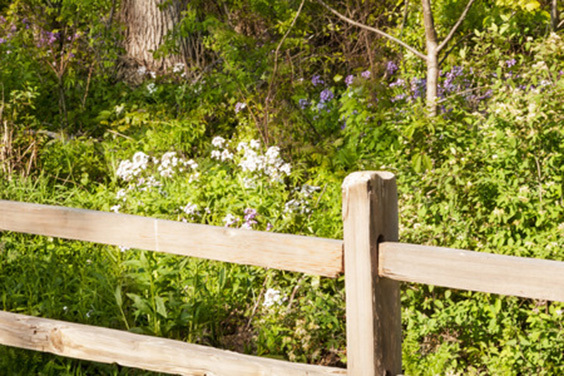 Fencing ideas aren’t just for yard and decking purposes. Rooftop vistas need a little love as well, and nothing is better than a brick and vinyl security wall topped with some helpful lighting. Modern takes on brick include fun shapes, smooth surfaces, and new color combinations. A concrete breakwall is topped by patterned bricks to form a secluded backdrop for this outdoor retreat. 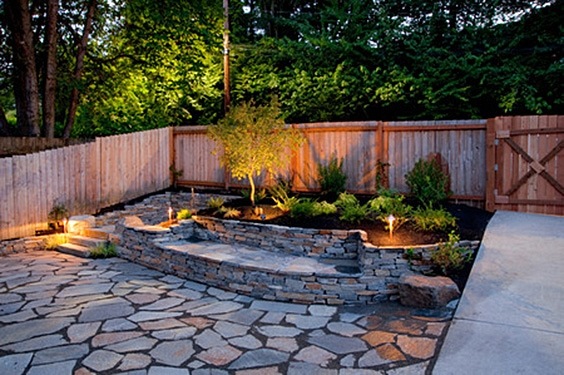 You don’t have to get busy digging through your backyard for enough rocks to complete a natural looking fence. 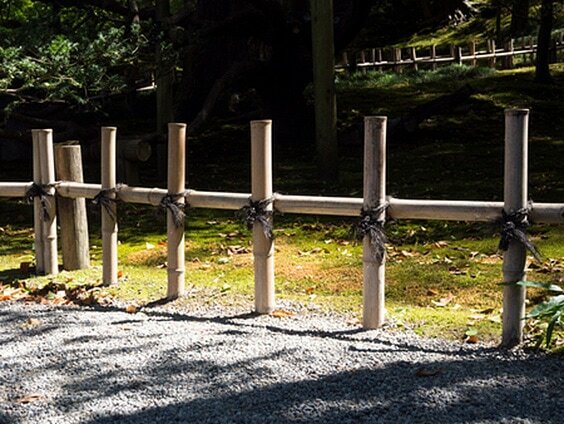 Landscaping companies sell rock by the ton- enough to create your own primitive looking fence to mark your territory. Have I mentioned this is my favorite? 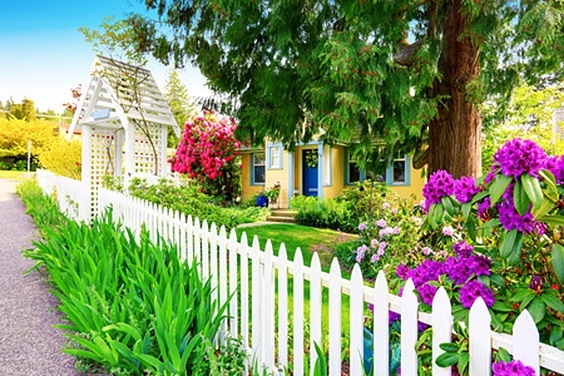 Nothing paints a picture of home-sweet-home like a white picket fence. 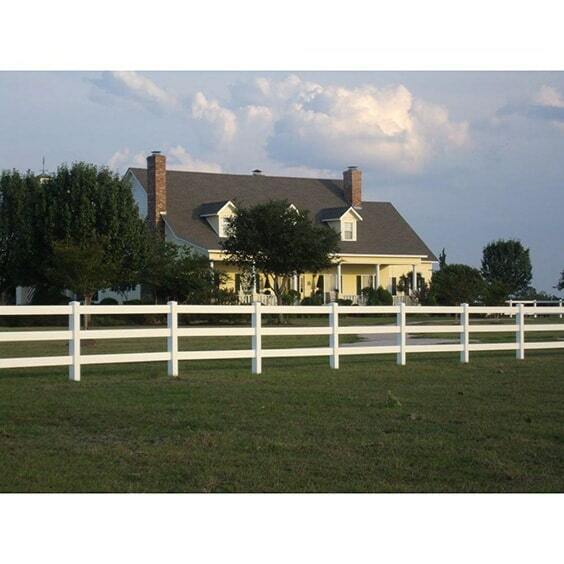 Not just for suburbia, white fences can be found in any rural or urban dwelling to apply a touch of comfort. Reinvent the look with material choices, placement, and even decoration throughout the year. 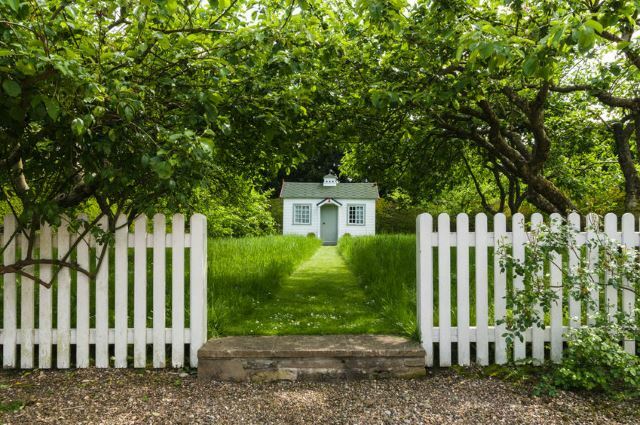 The appeal of the white picket fence speaks to the ideal of the new homeowners in that it symbolizes independence and financial freedoms. 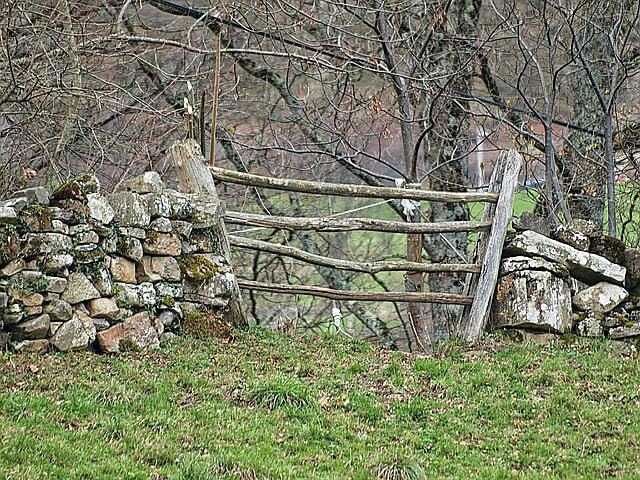 No wonder it is still a popular fencing choice throughout the country. 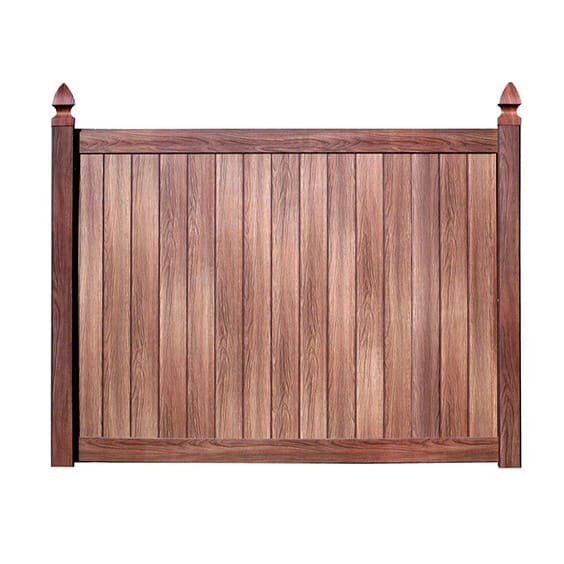 Wooden fence choices are a popular alternative to other fencing options to provide a border leading to areas that are off limits. On this property the overlooking forest view can be appreciated and isn’t marred by large posts or chained fence. 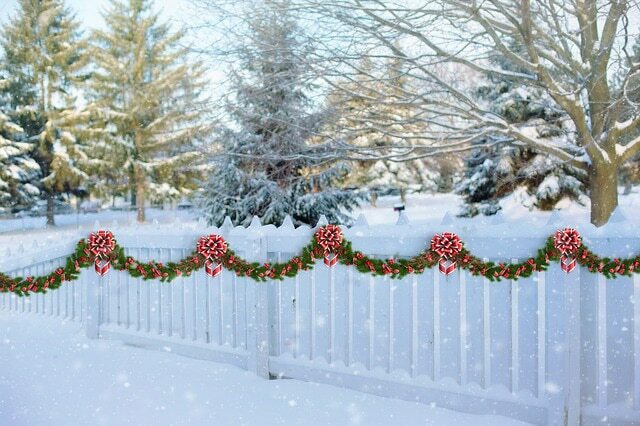 A white backdrop provides a perfect canvas for holiday decor and decoration, so why not use your fencing to complete the look? Traditional white designs come in a variety of materials to last through the seasons with very little maintenance required. No need for a fence? 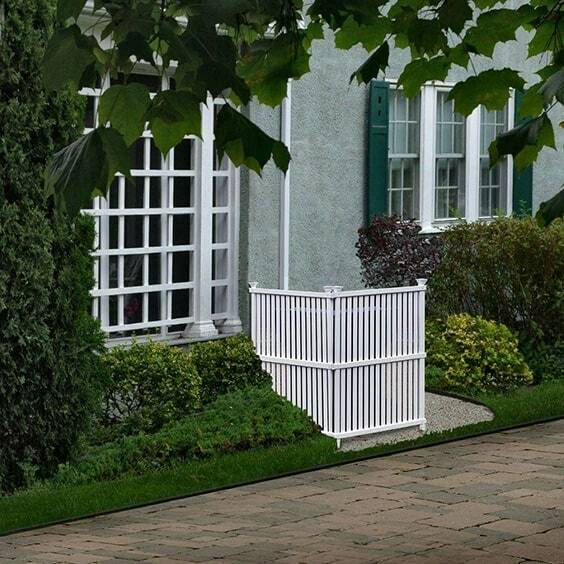 That doesn’t mean you have to abandon the use of fencing in your landscape. Try using partial panels to hold back unruly flowers, or to add height as a backdrop to brightly colored blooms. 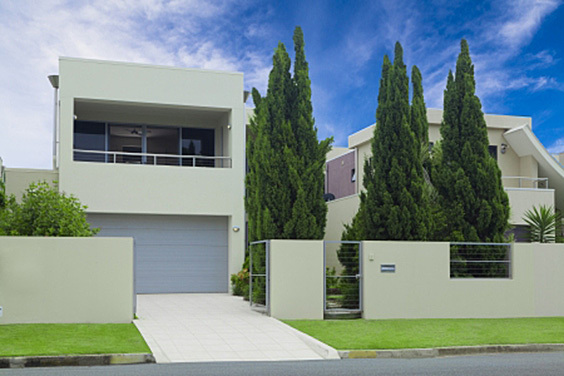 Choices in vegetation surrounding your fence can bring your landscape to life. Such as on this property where vibrant rhododendron and crepe myrtle make a stunning statement. Contemporary lovers rejoice! 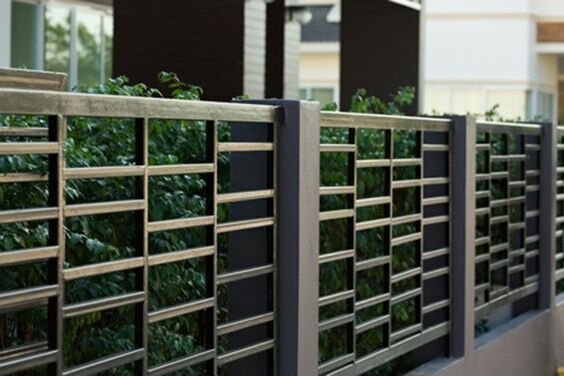 This blend of traditional and modern fencing design creates a landscaping edge of clean cut, and well measured simplicity. 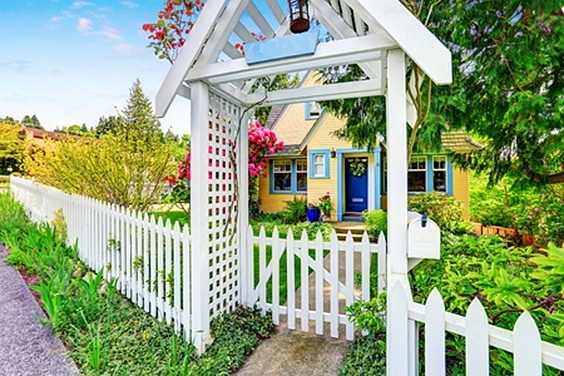 Cascading sections of fence draw your eye towards the house to create a welcoming entryway. 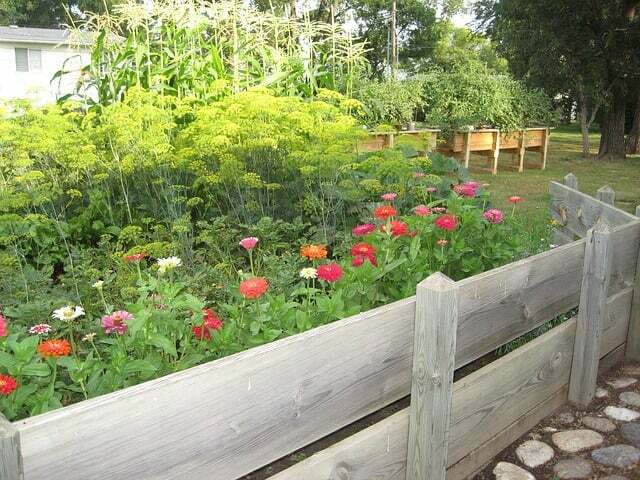 It’s all in the detail concerning this fencing design that wraps around the property of this vibrant garden. Provide a foreground of gracefully drooping lilies or iris to your fence to give the illusion of added depth. Finish off your picket fencing with an elegant arbor entryway. Brilliantly colored flowers make a stunning contrast against the white, and you can consider planting perennial climbers, such as roses and climbing hydrangea with the added vertical support. 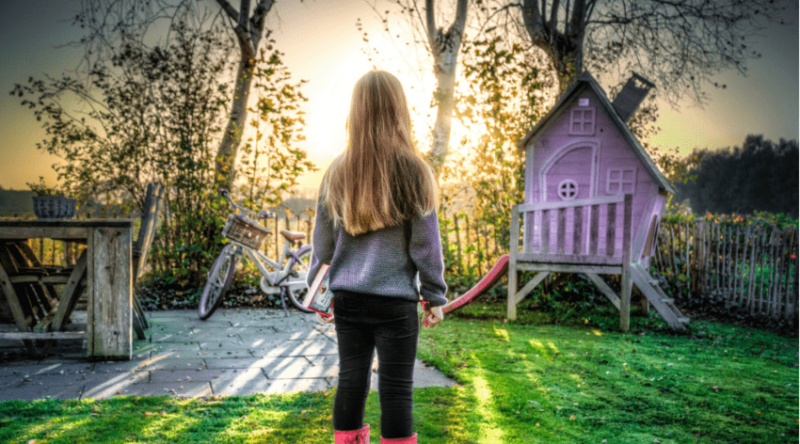 Fencing options can be easily extended to your children’s play area such as in this lovely take on a playhouse and the associated space set aside for play with the use of traditional fencing options. 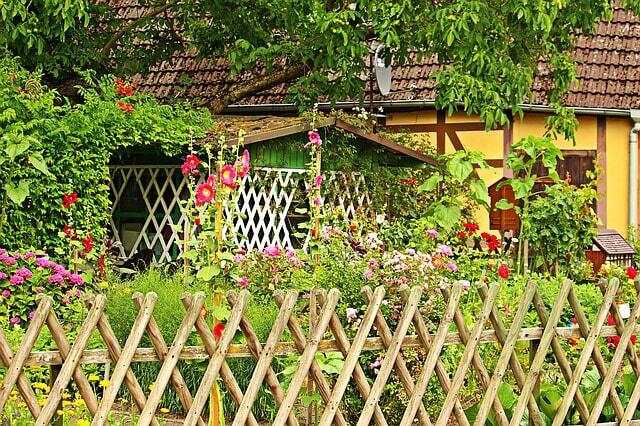 Fencing designs with solely the garden in mind take on the whimsical and eclectic with ease to provide complimentary texture and color, as well as garden flow throughout your yard. Mix and match your wooden hues, shapes, and sizes to provide visual appealing structures amongst your beds with the help of simple fencing ideas. Lattice work can be created using a variety of materials and lends both support to your vegetation and visual appeal to your garden landscape. You can also hide unsightly walls with delicate lattice work to give an effect of garden depth. Textures and mixed media are a part of your garden already, so why not add some interest through varied materials? 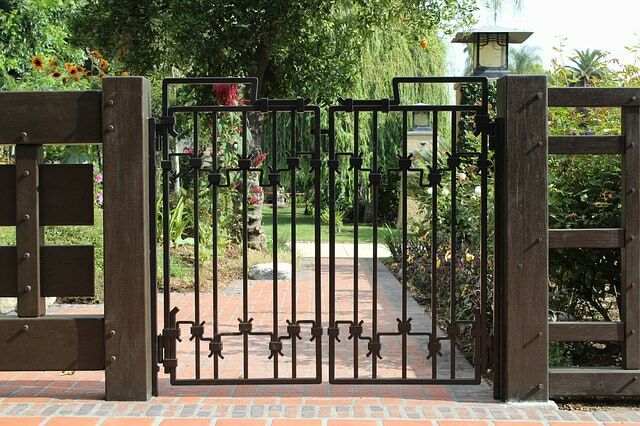 Wood, concrete, iron, and brick all round out this eclectic fence and gateway into a country garden. 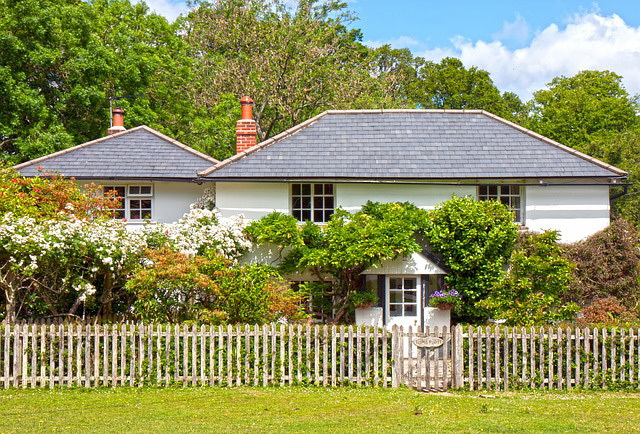 Well manicured garden beds and stone pathways are enclosed by a rustic a weathered barricade of wooden posts to add country cottage appeal. Fences also provide support for other garden ornamentals. Fences don’t have to be built of wood or stone, they can also be grown, such as this hege of colorful hydrangea. Mix and match your vegetation to include evergreen varieties for year-round color. 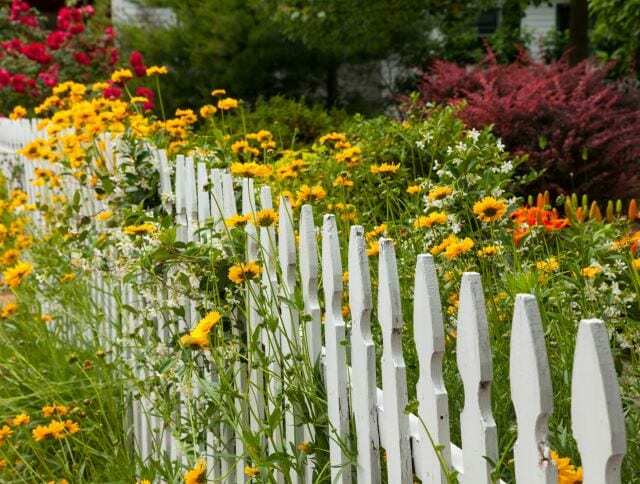 The best garden fencing options, in my opinion, are those intertwined with long stems and plenty of blooms. Coreopsis is always a beautiful choice with it’s spreading growth and long lasting blooms that last all summer and fall. 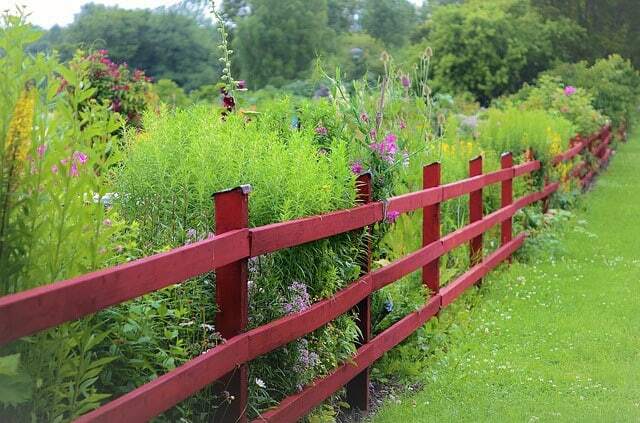 If it’s a garden fence you seek, why not use it to extend your vegetative footprint? 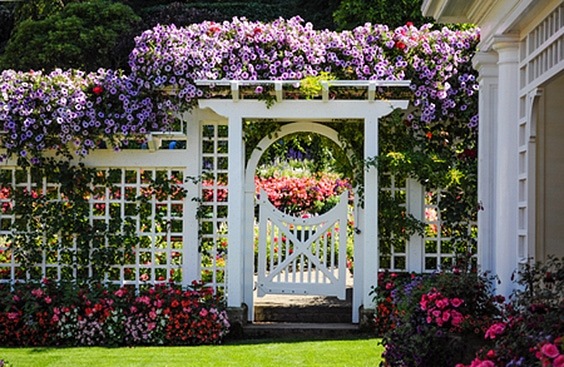 Use your fence to support a wide variety of climbers, hanging planters, and trailing varieties of blooming flowers. Japanese garden landscaping combine simple, basic elements of plants, water and rock with clean, straight lines for an aesthetically pleasing atmosphere that balances with the environment around it. Incorporating these ideals into your fencing ideas create interesting and unique looks for you outdoor living space. Straight lines highlight the smooth panels and clean look of this privacy screen topped with an intricate metal roofing. Uniform colors allow your eyes to glance along its length before moving onto the rest of the landscaping you incorporate into your yard. 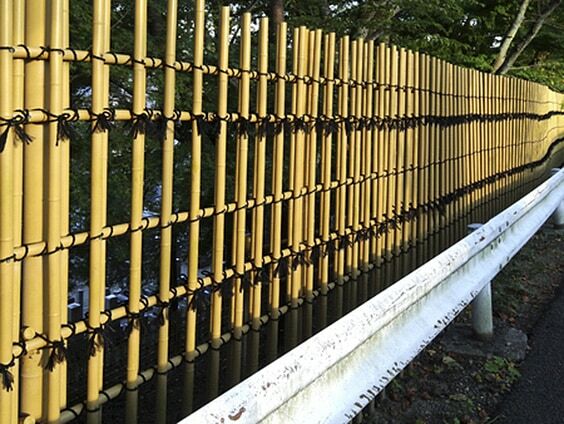 Simple bamboo poles tie together to create a short, but effective pathway through a forested walk. Due to uncomplicated design, the variations of green are brought to the forefront with without creating a sense of clutter. Thin gathered bamboo stalks left in their natural state and woven together create an effective barrier that is both strong and long-lasting. It is also effective in providing privacy in a unique way unlike many other options you may have considered. 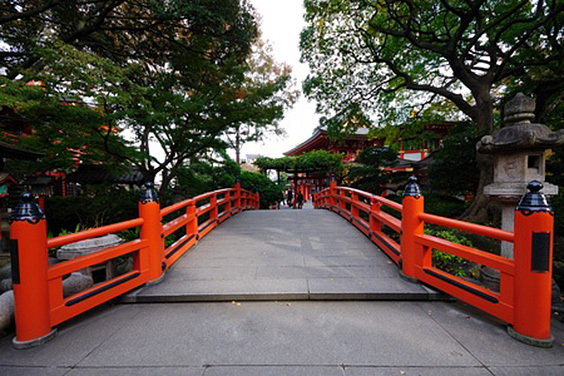 Japanese design doesn’t incorporate a lot of bright colors into their garden landscaping to allow the vegetational shapes and colors form the palette. When it is used, simple bright, basic colors are used to help highlight the surrounding landscape properties. 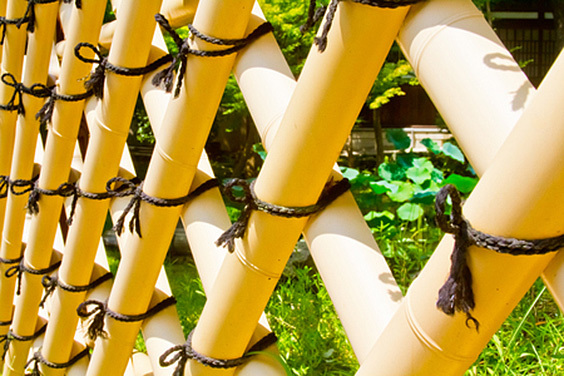 Bamboo lattice is a popular screen choice both indoors and out, and the uniqueness of the colors and textures are offset by how they are tied together. More traditional screens will use natural fibers, whereas you can easily create your own look using your materials of choice. Space out your woven canes to create a screen that lets in both light and casts shadows to lend to the effects within your garden depending on the time of day. The use of large boulders mimic the curves and contrasts of mountainous ranges when used as a border between outdoor spaces. Instead of building half walls with mid-sized rocks placed together, use your larger choices to make a statement larger than life. 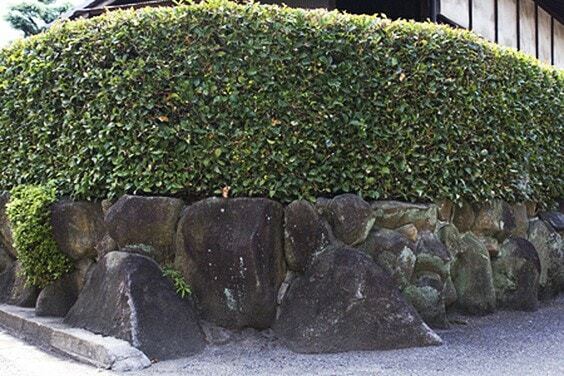 Stone carvings are traditionally found within simple Japanese gardens. 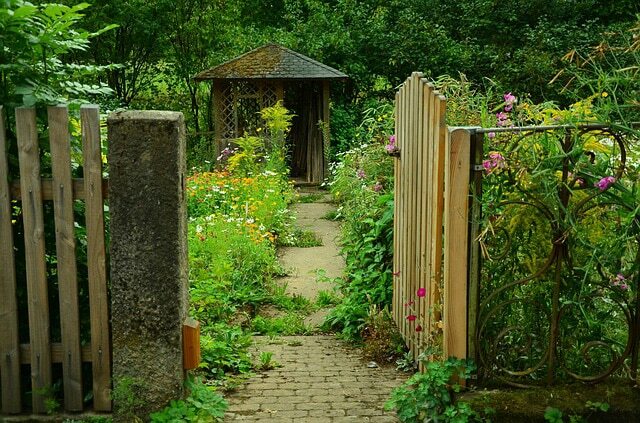 Try adding in carved posts in lieu of wooden or iron choices to bring a new interest to your garden pathways. Bright colors, sleek vinyls, interesting design patterns, and mixed media are all a part of the old and new clash of designs that can easily find a home on your property. Don’t discredit more modern and contemporary ideas, or primitive and old-fashioned textures. Instead embrace the differences and see what they can do for you! 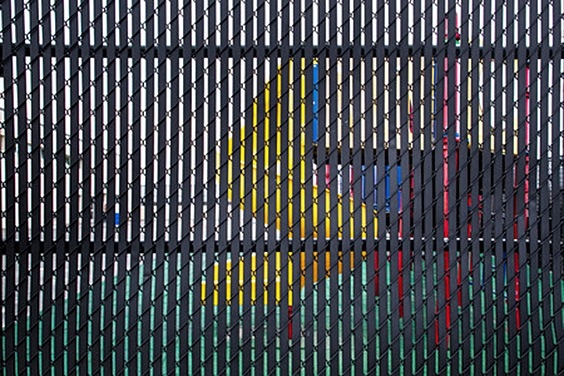 Colorful fencing adds fun and free spirit to this developed property. 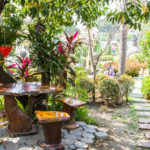 This idea can be area in any area to help break up the stark contrast of street corners and concrete jungles, as well as add a touch of whimsy to a garden walkway. 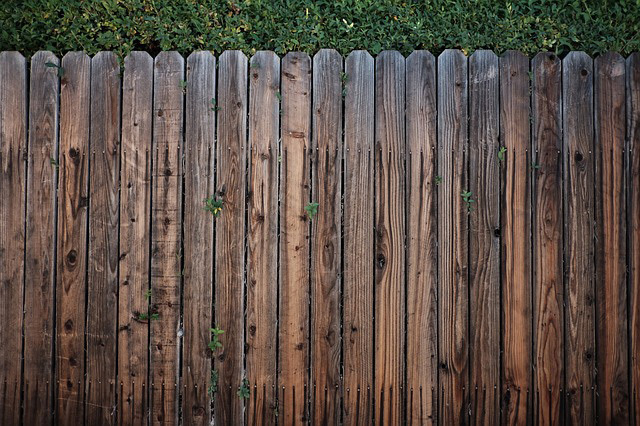 Rather than placing your fencing boards vertically, mix it up and opt for a horizontal look to draw the eye along the fence. Smooth grains and varied wood stains add an extra touch of detail. Metal sheets and profile board create a unique and modern look at the lawn’s edge using materials normally reserved for housing projects. 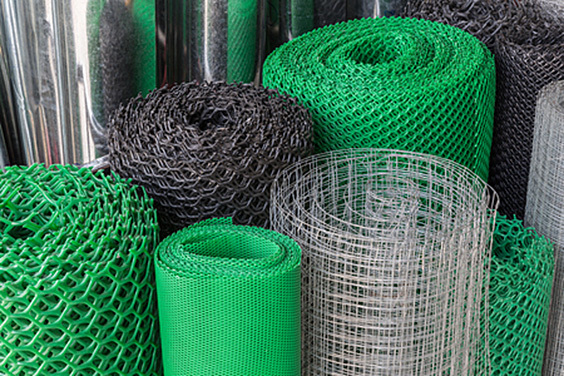 Don’t be afraid to think outside the box when it comes to your yard and pull from a variety of materials found in any contractor’s supply store. 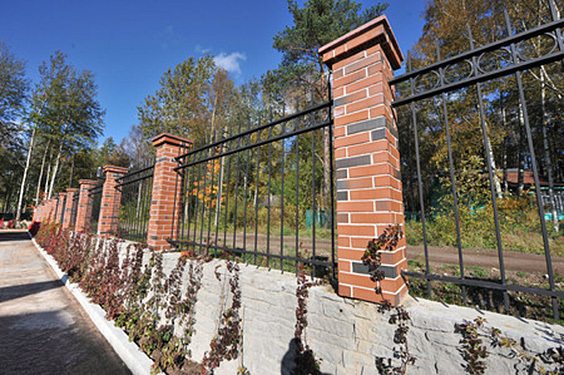 Contrary to how it sounds when using concrete as a fencing option, concrete can take on many textures and hues, and provide a elegant boundary within your yard. 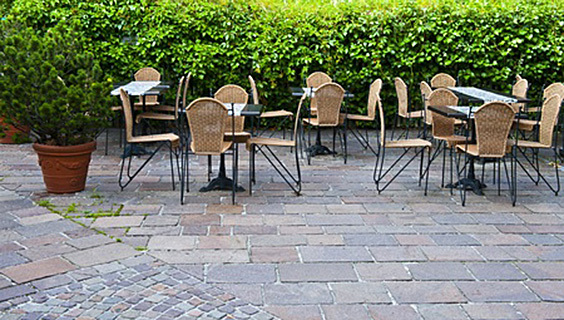 Consider low walls, and colors that match your surrounding patio or walkway choices for uniformity. Polymer ‘wooden’ fencing looks much like the real deal, but lasts much longer without the weathering and warping real wood is wont to do over time. That’s why it is a great choice in this privacy screen fence used with a metal frame to keep the surface flush against each other for years of use. 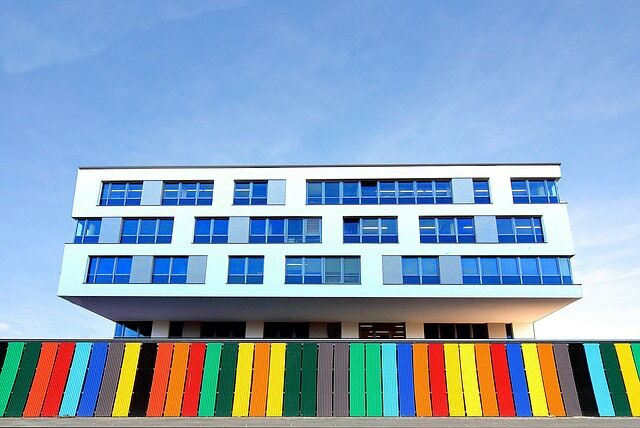 Mixed media materials have become a trendy option concerning modern facade. Neutral hues complement the upscale apartment housing while providing a degree of security and privacy in this urban landscape. Smooth dark metal creates long lines and long shadows throughout the seasons in a present day property border. 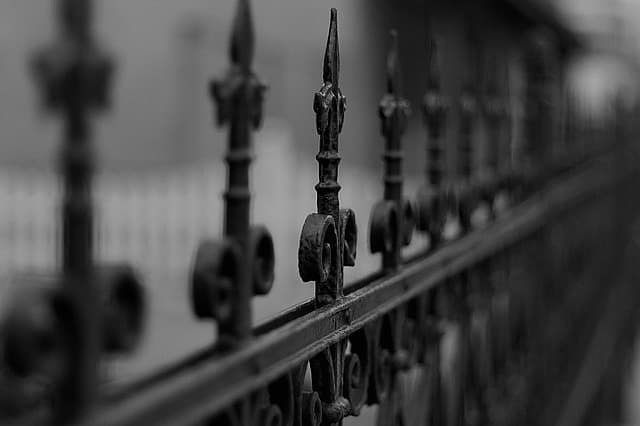 Certain metals have their own weathering properties to bring even more aesthetic value to your fencing choice. Consider a continuation of colors and material from your property buildings to your privacy fencing. Consistent lines and shapes make a pleasing view for anyone who happens to drive by. Update the rural livestock panel look to an urban decor with sleek metal posts and entryways to create a wholly unique alternative to your yard boundaries. 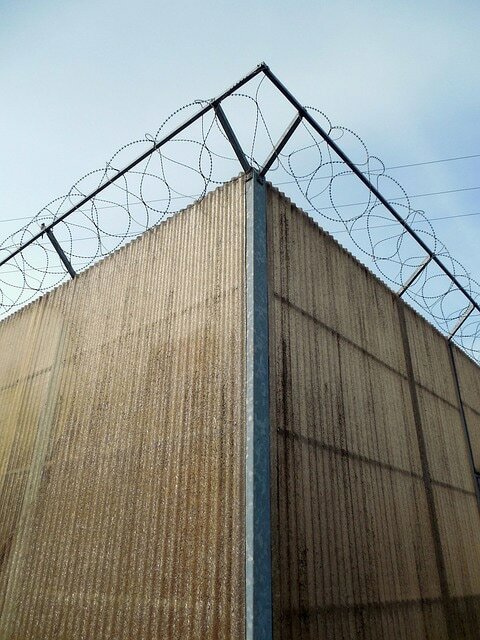 Paneling wire allows an unhindered view of your landscape, all while protecting the property from unwanted visitors. Decorate the outdoors with familiar hues and provide coordinating materials to create a sophisticated welcome to your guests when they arrive. 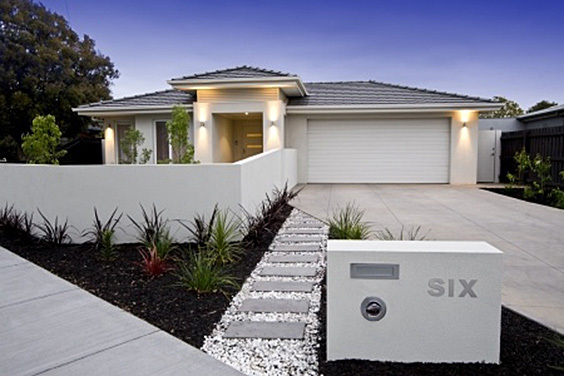 Simple xeriscaping makes a bold statement amongst the whites and light grays of this modern design. Many of the choices in this lineup border on the rustic, but through the addition of the unexpected bring a new twist that is preferable within present day garden choices. 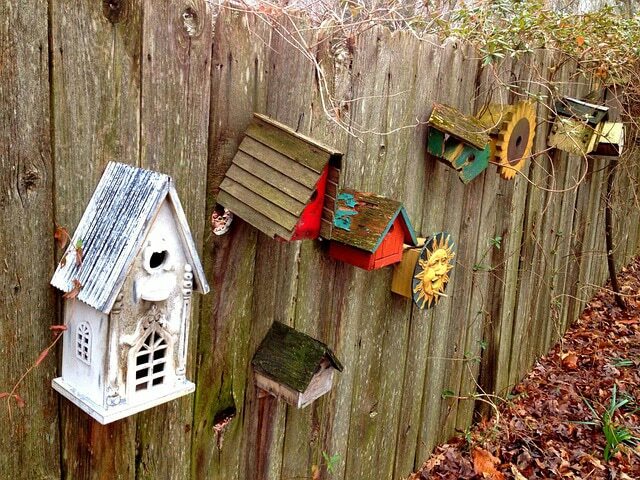 Textures, building materials, and colors are all part of the play on the unique backdrop that makes your yard what it is. 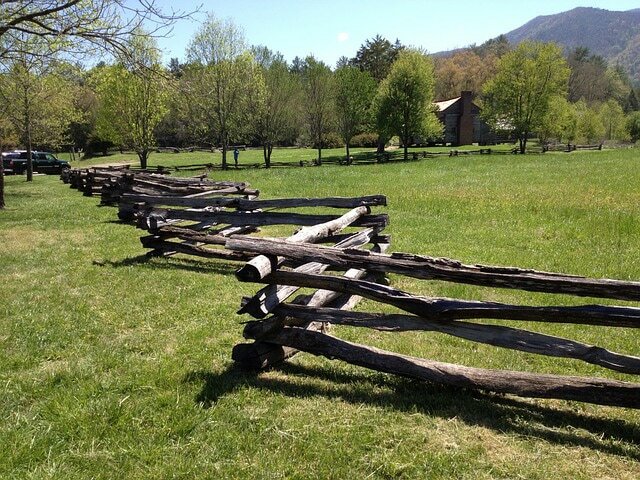 Split rail fencing used to be an effective way to keep critters in and predators out. But updated designs can provide a primitive and rustic feel to your yard if you are willing to have the patience it takes to stack your rails correctly. 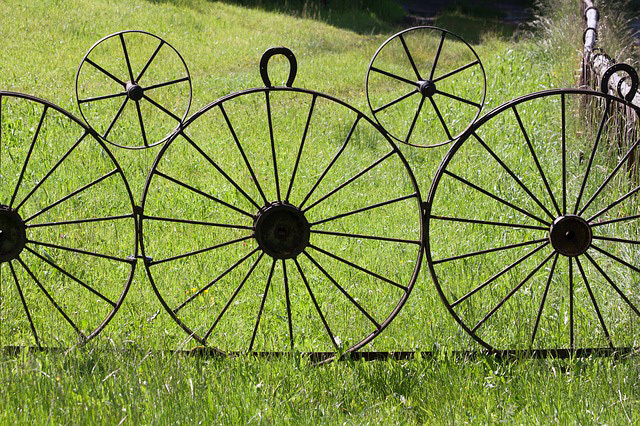 Old Iron wheels and horseshoes round out this totally one-of-a-kind fence that has been welded together to create a treasured garden piece. 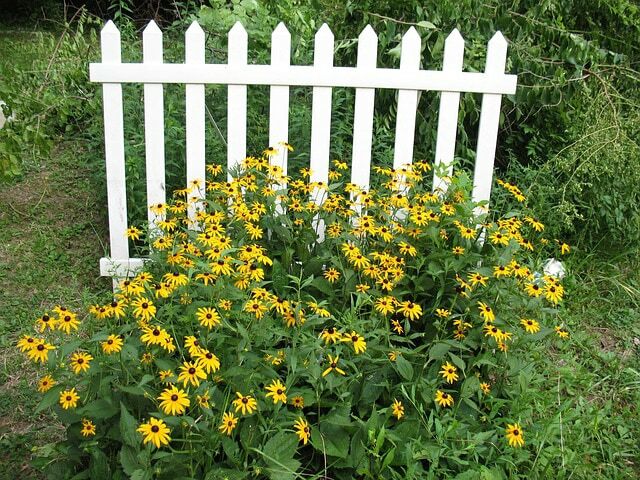 Dual-purposed, it serves well as an ornament, as well as an effective border fence. 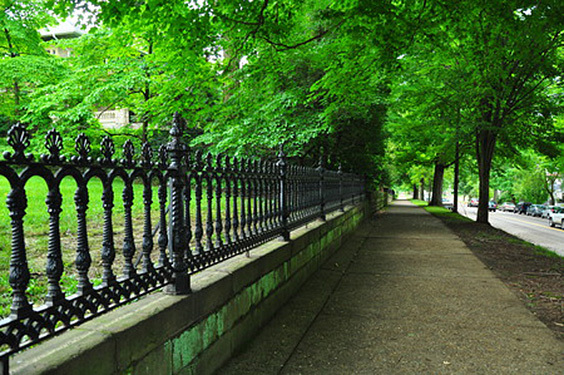 Small rounded rails create a delicate fencing look along the stunning greenery of an outlying field. Straightforward in it’s simplicity, this is an easy idea to copy and put to use. 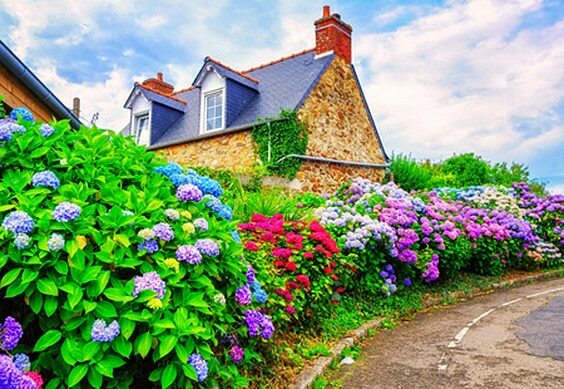 Large cottage homes have large cottage gardens and need an equally impressive boundary line as well. Lengths of weathered wooden rails contain the rambling of the garden beyond while providing a beautiful frame to it’s rising house. Popular amongst parks due to the nature of zig-zagged stacked rails that require very little in the way of construction, you can update this version with shorter materials, and supply stack one upon the other until you reach your desired effect. Antiqued polymer boards, rustic looking bolts, and carefully crafted iron design give a modern twist to an old-fashioned barnyard feel. Mimicking the look of old barb wire and barn doors, this is style that will make an impression in a more modern setting. Materials gathered natively create an eclectic feel and blend well into the surrounding landscape. Have fun gathering up the rocks, wood, and other various items you can use to piece together as a real-life jigsaw puzzle that fits a picturesque purpose. 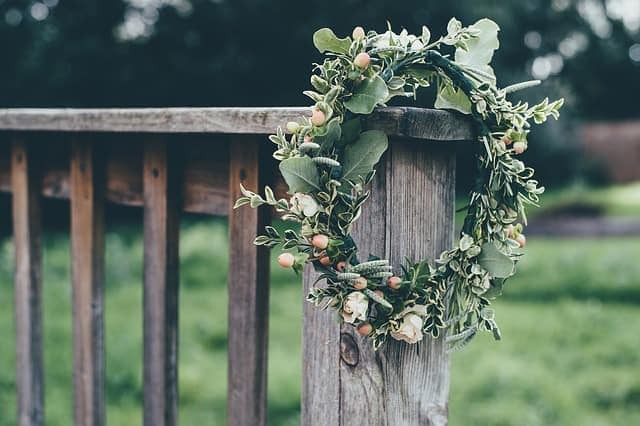 Before you decide to replace or tear down an old fence, consider refurbishing it with items of your choice to create a fun and surprising backdrop along your garden walkways. Patios are a peaceful outdoor retreat, so it follows that privacy is less an option, and more a necessity for those seeking an escape from the rest of the world. 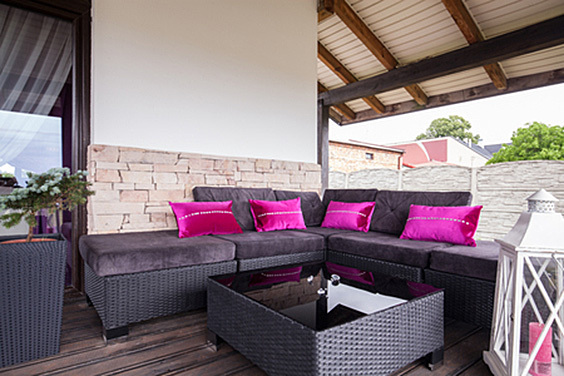 Because they are truly an extension to your indoor living spaces as a outdoor room all to your own, consider decorating it with those items that remind you of rest and relaxation. An outdoor patio that is tucked away from busy pathways and drives still deserve a modicum of privacy. 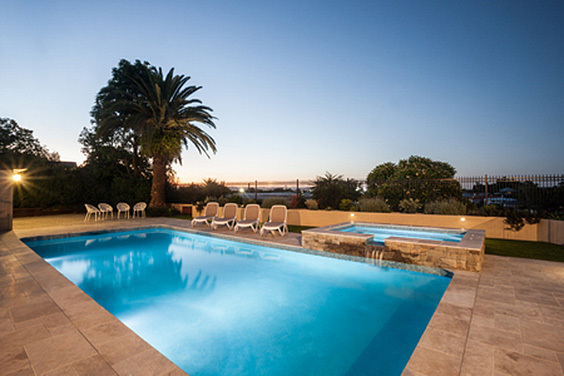 This elegant outdoor sitting area is surrounded by iron fences and well placed lighting for evening of entertainment. 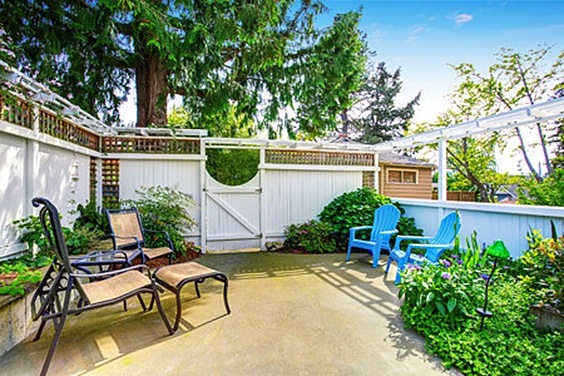 Tall fences surround this large outdoor sitting area to keep out unwanted attention, and keep in the entertainment you may enjoy in such a large space. Towering trees and bushes increase the feel of your own private forest getaway. 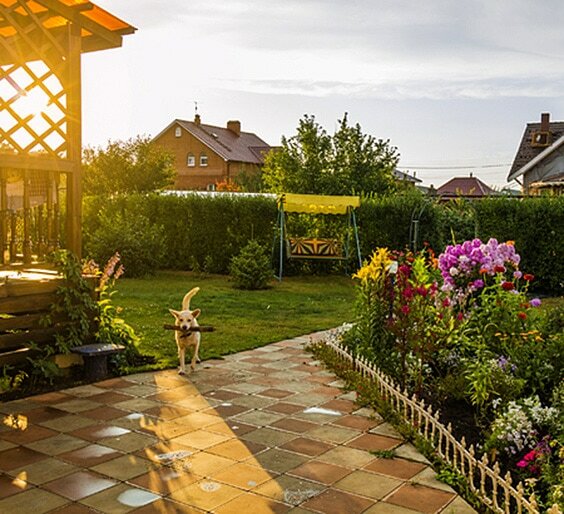 Just because you have a small urban yard doesn’t mean you need to sacrifice your garden spaces or privacy due to close contact with friendly neighbors. Well planted shrubs and planted gardens provide the extra degree of seclusion you crave when combined with well placed lattice screens. Just because you are considering privacy fences to provide a bit of separation from surrounding houses doesn’t mean you have to block the beautiful views you may enjoy as well. 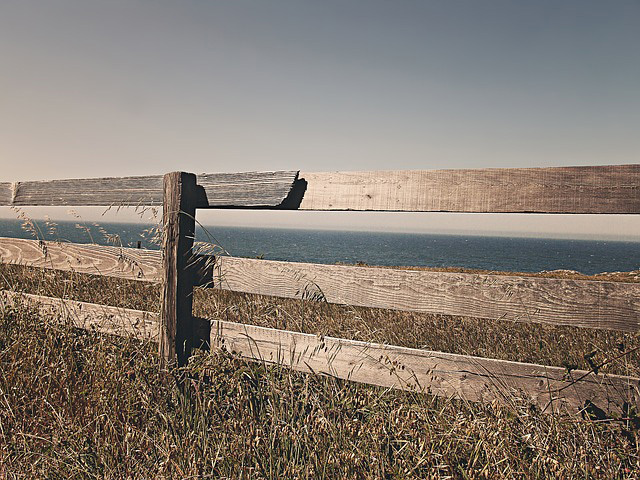 Consider partial fences that open to the vista’s you enjoy. Using evergreen hedges as your sole means of secluding yourself from the world is always a viable, and affordable option. Just be sure to take the trimmers to your hedges at the correct time of year to keep them healthy and abundant. 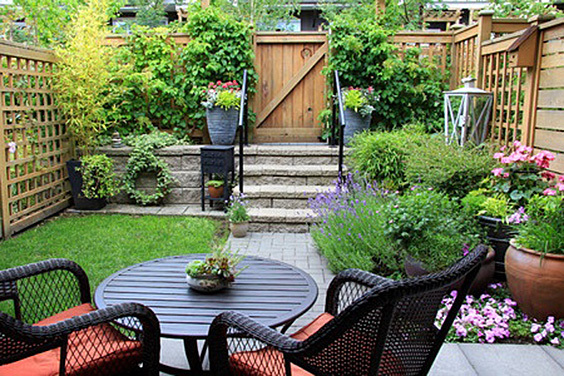 Patio fencing doesn’t have to be focused only on the surrounding property. 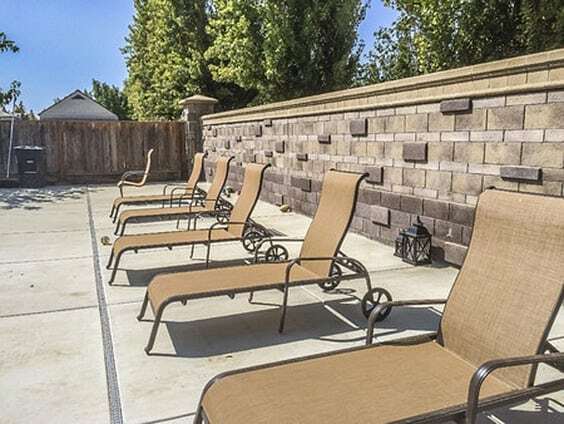 Consider bringing your design into the space as well with partial fences secured to the walls such as in this faux stone design surrounding a comfy retreat. Privots have been a popular hedging choice for hundreds of years due to its quick growing nature, ease to shape and trim, and the beautiful blooms that put out a heady scent each spring. Tall brick walls round out this narrow patio tucked away behind suburban sprawl. Overgrown ferns and other vegetation effectively hide the outdoor world to create an escape your family can call all their own. Vibrant cannas give depth to this low lying fence and provide a sense of escape to those tucked away behind their tall beauty. 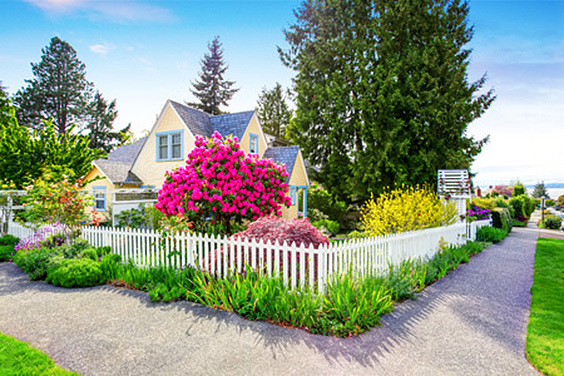 If you discover you have inherited a fence that is lower than you prefer, consider planting tall, eye catching plants that help block prying eyes, but give more width between you and the outside world. More expensive as an initial purchase, this is a product you can use over and over with little concern for wear and tear. 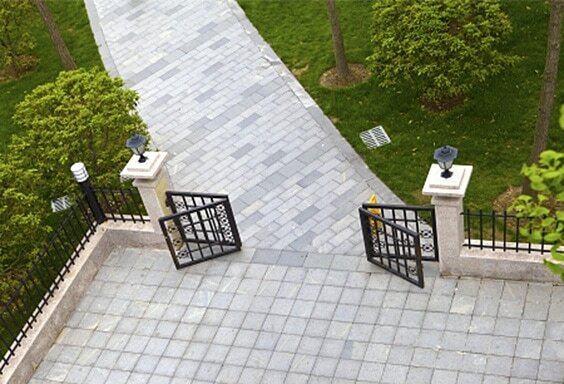 Durable metal paneling stacks flat, but can provide effective barriers to define boundaries. 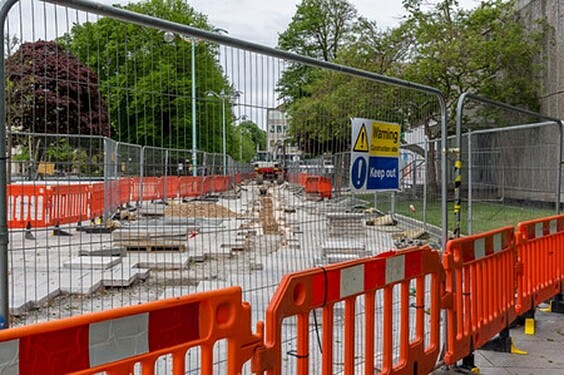 Durable plastic barriers are often bright colors to warn people of its location. Use inexpensive wire paneling to help prop this type of temporary fencing up if you plan on using it for an extended amount of time. 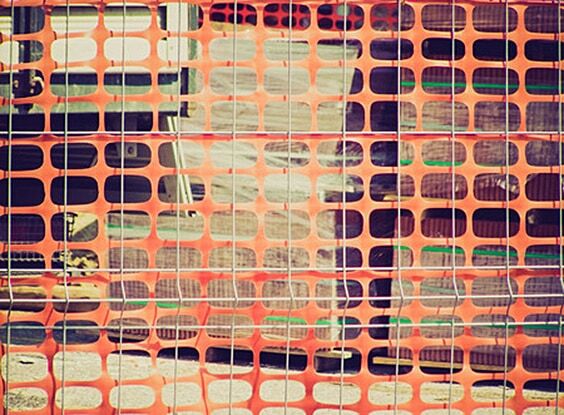 Lightweight aluminum barriers are an effective fence for traffic control, or yard protection in areas of construction. Easy to maneuver, these panels stack together when not in use. 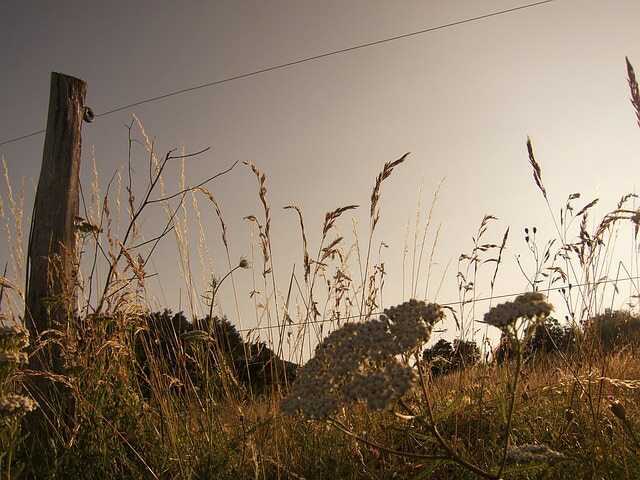 Tall wired fences provide protection in high foot traffic areas, but can be used in a variety of situations to help keep out unwanted critters, such as deer, when your gardens border rural areas. The height of these panels are too high for most ungulates to jump. 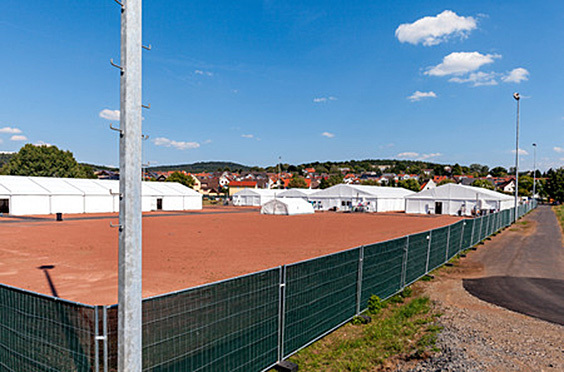 No matter your need, temporary fencing materials generally comes in a wide variety of choices either for a one time use, or over time in multiple situations. Choose what works best for you and pick materials that will last. 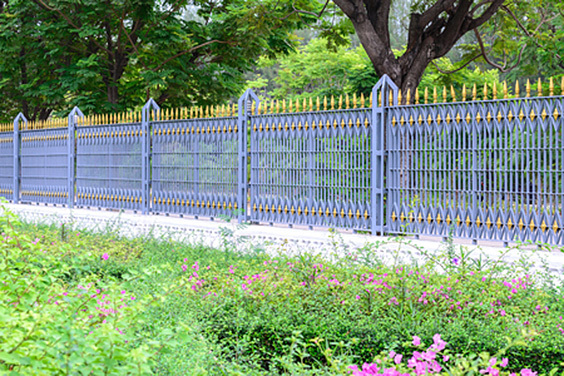 As decorative as many fences may be, they are a necessity for many reasons, and have more practical uses that not. Although we love them within our gardens, alternate choices are available for both home, and commercial privacy and protection. 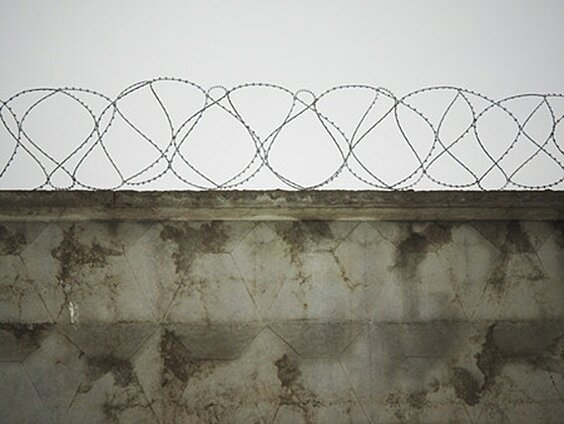 Concrete barriers topped with rolling barbed wire is an effective hurdle against trespassers, and is often used to protect larger items of value. 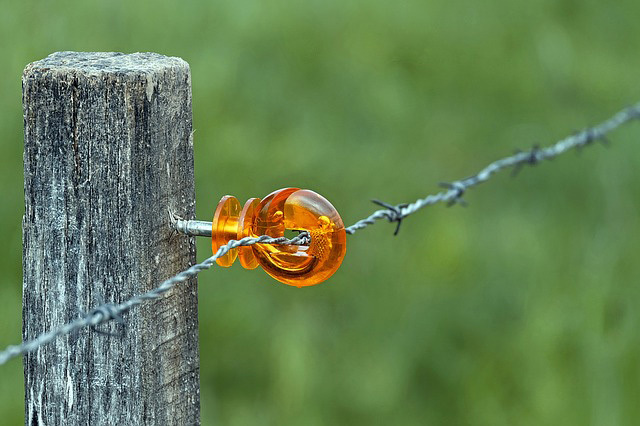 In rural areas that require something a little more persuasive than split rail fences, farmers and ranchers will create single lines of barbed wire to keep horses and cattle from grazing in the wrong areas. Fence mounts screw into existing timber to run a tangled free line along the tops of each boundary. 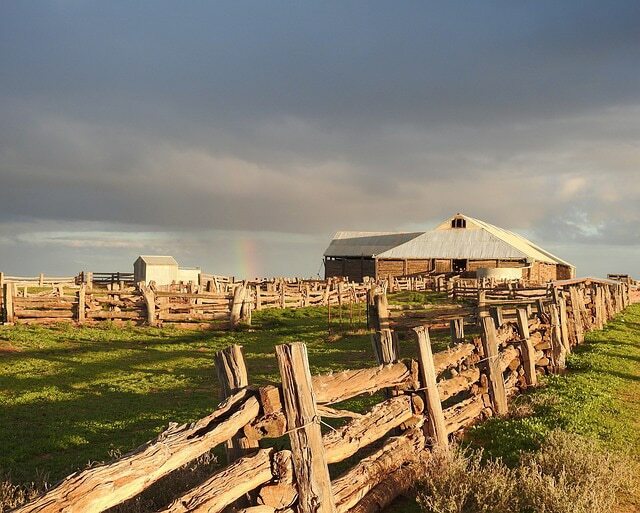 Simple heavy gauge wire can be run in lines of two or three and be quite effective in keeping livestock where it belongs through the use of electricity. Hot wire is created using a fence charger that can be run either off electricity, or solar powered. 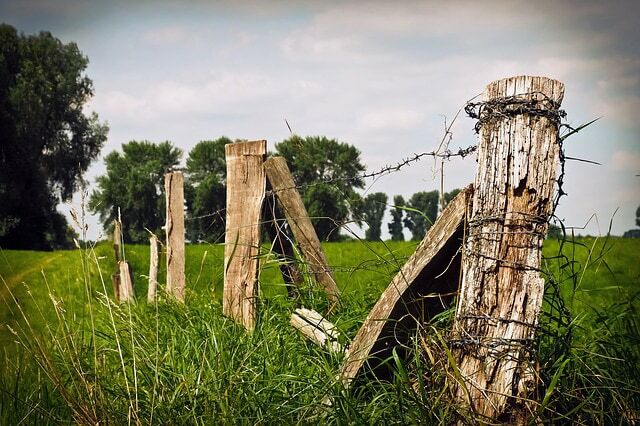 An old livestock fence lays worn and weathered after decades of use and neglect. Beware fallen barb-wire that can tangle up in livestock legs and in vehicle tires. 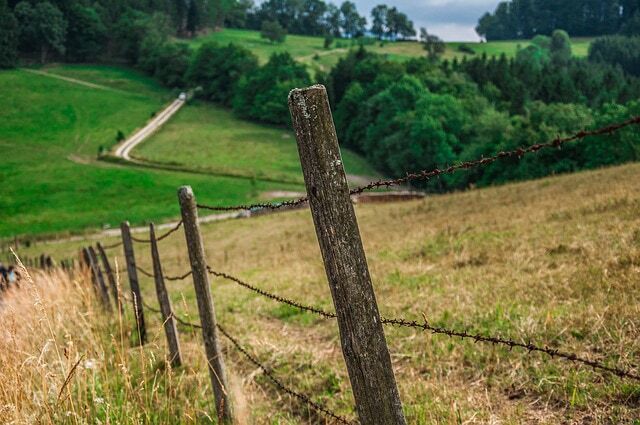 To avoid the above scenario, check your fence lines periodically to tighten drooping wire and patch up any areas that have been run through by wildlife, or had vegetation fallen against it. 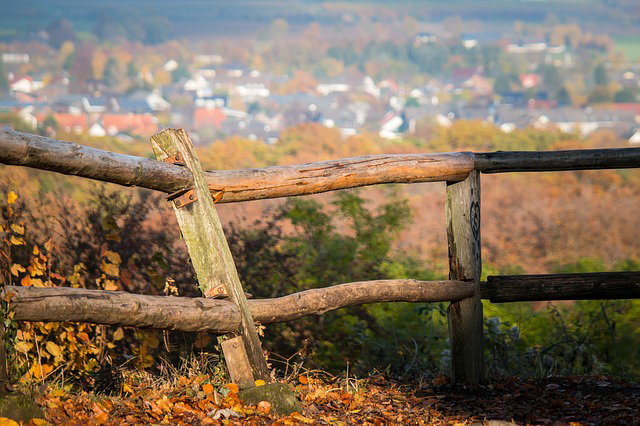 Proper fencing can last a lifetime with occasional maintenance measures. 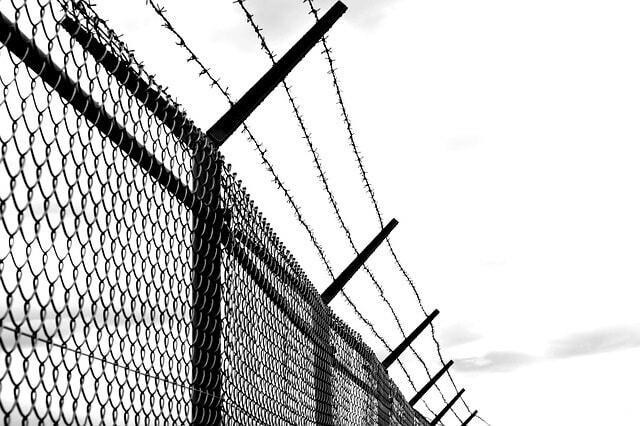 Chainlink fencing and barbed wire are a force to be reckoned with and can generally be found in parking lots, dangerous building sites, and other areas of high security. If you are looking to protect large areas of commercial property this is always a decent choice. 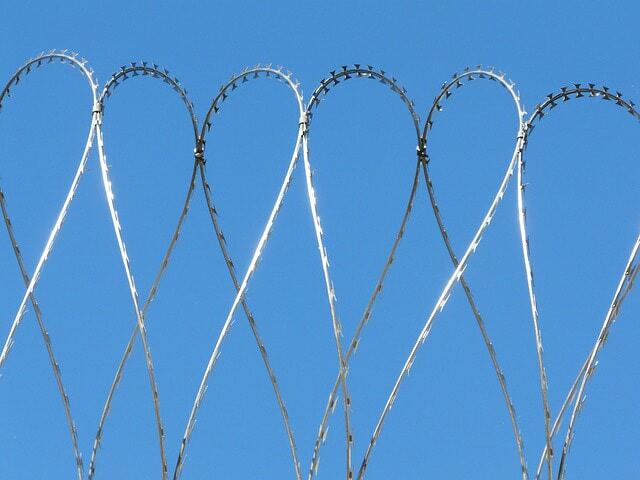 Razor wire is an alternative to barbed wire and is a much more dangerous product to install. The use of it sends a very serious message and is not to be trifled with. 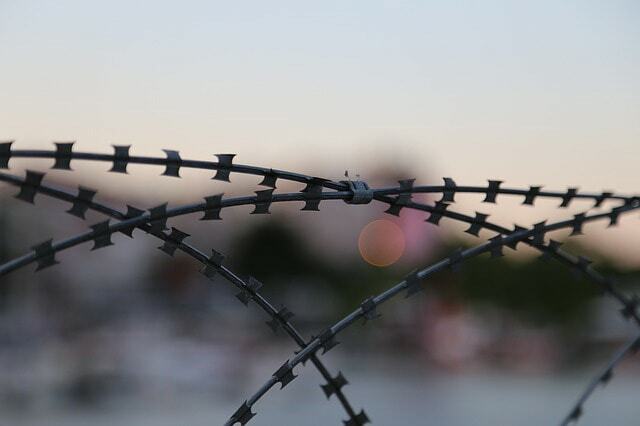 Galvanized steel walls topped with razor wire screams both keep out, and you aren’t getting out. 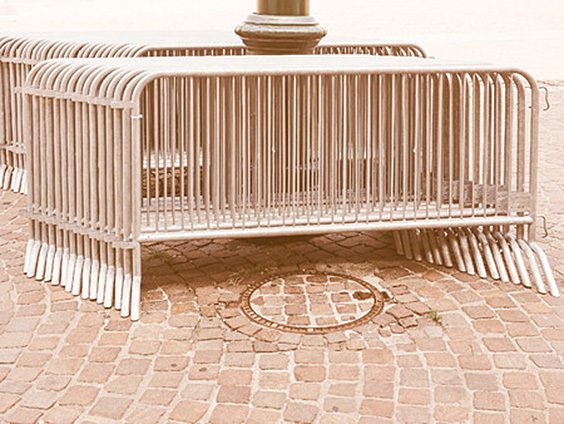 An effective deterrent, this design is most used in and around jails or prisons for obvious reasons. 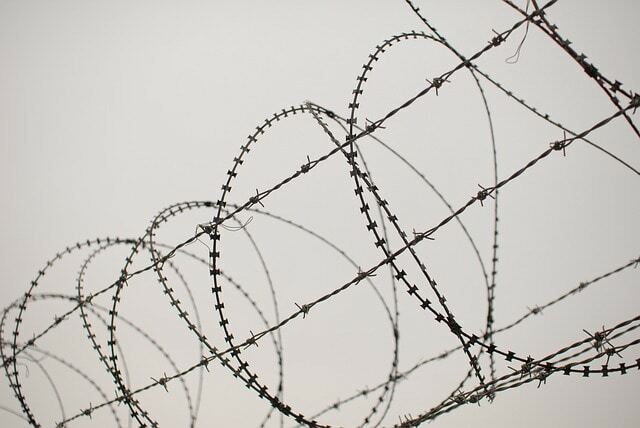 How razor wire is used is important for its overall effectiveness. Keep in mind that this materials is for security purposes, and it’s use should be handled with care. Nothing screams ‘stop’ quite like razor wrapped barbed wire. As mentioned above, these are techniques used for security and are quite effective as a deterrent. 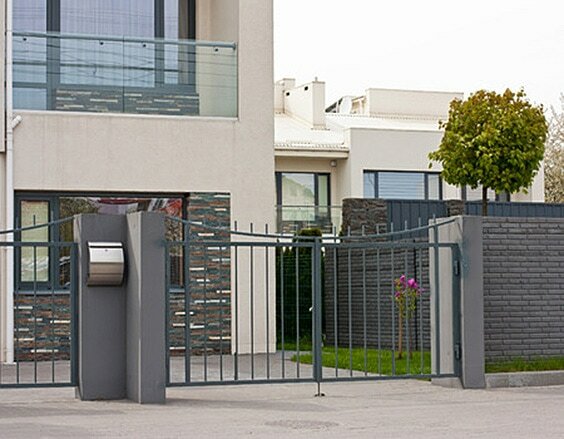 Chain link fences are a good go to option, and can be used in a plethora of ways in both urban and rural settings around the home or in public areas. Although alone they are not good choices for privacy, when woven with strips of vinyl you can create a privacy fence worthy of any area. 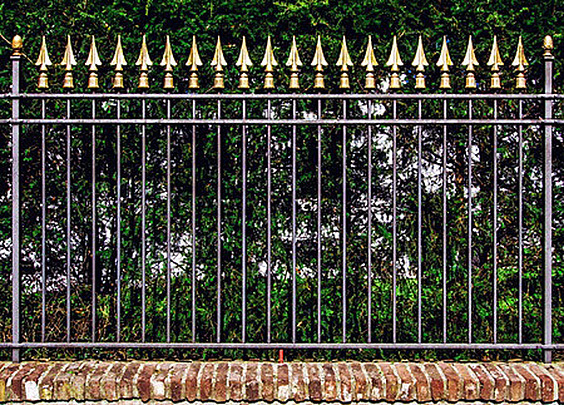 As you can see, fences can be anything you need them to be, and be made of just about any material your heart desires- whether you are looking for garden accents, privacy, or protection. Hopefully I’ve given you enough ideas to scroll through no matter your need, and am looking forward to any alternatives that may have been left off the list. As always, please share your ideas below and if you have any questions we’d be happy to answer them! Thanks! We like them all! Thanks! Can’t wait to pick one to put to use! These are really cool ideas! What would you suggest for a yard boundary on one side of property? It would be as close as possible to the boundary. We have neighbors that are real jackasses. They like to sue neighbors and call the cops on other neighbors. Is Pressure Treated Wood Safe? 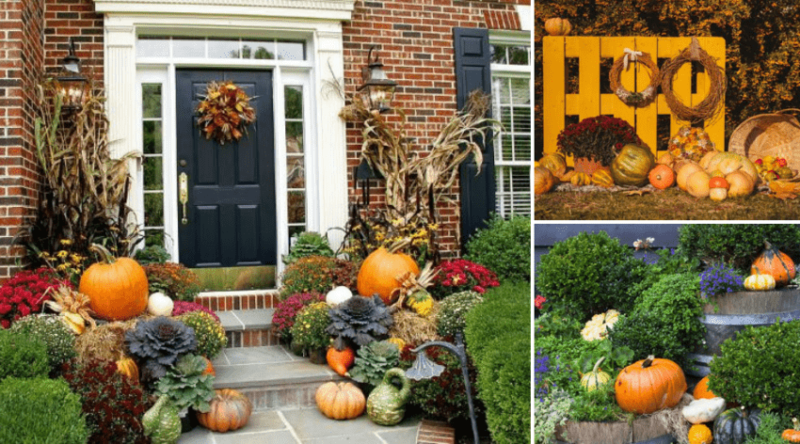 22 of the Best Fall Landscape Ideas: #17 is Perfect!